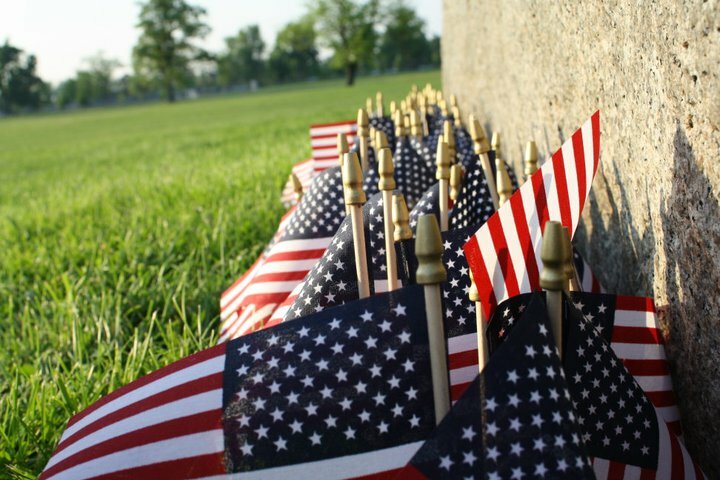 Many of us are making plans for a three-day weekend, but in this run up to the Memorial Day weekend– we’re remembering the sacrifices made in Buffalo and by Buffalonians. 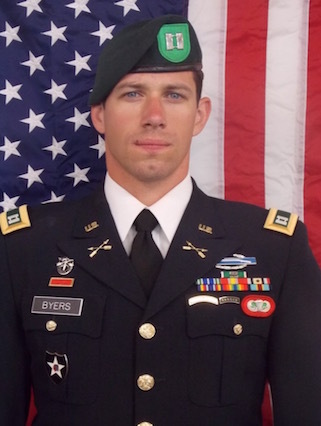 On November 3, 2016, Andrew Byers, 30, a Captain with the Army’s airborne 10th Special Forces Group was killed in Afghanistan. “Gone are the days of Memorial Day as the start of summer and worrying about whose barbecue we’ll be going to,” says Lauren Byers, Captain Byers’ twin sister. 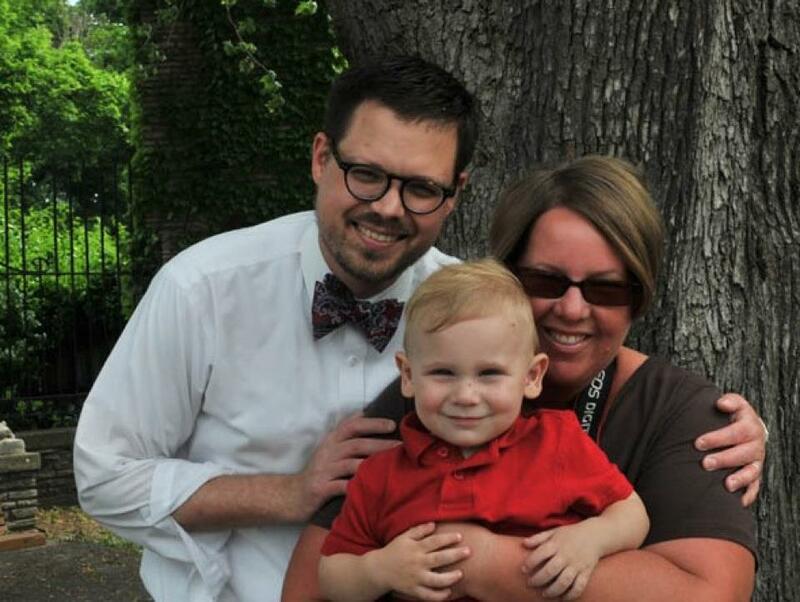 For Lauren and the Byers family, Memorial Day is now more than ever about striking a balance. 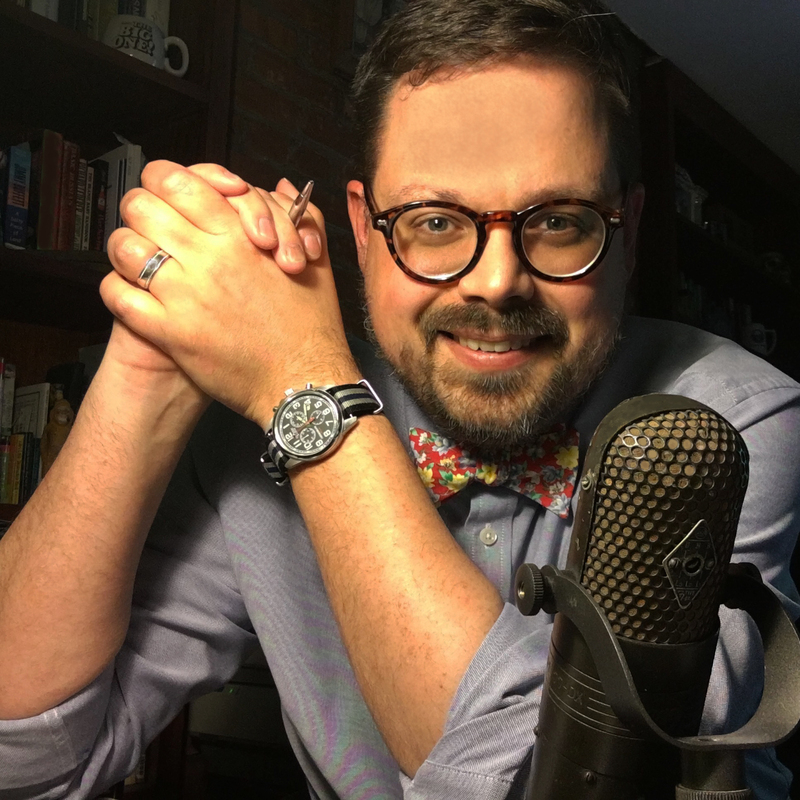 “I think we’re all looking for that thing to do to honor him, but also not be frustrated when you see all the commercials and ads that say ‘splash into summer’ or ‘Memorial Day Sale’ and not feel that twinge of pain, that that’s not really what Memorial Day is,” says Byers. 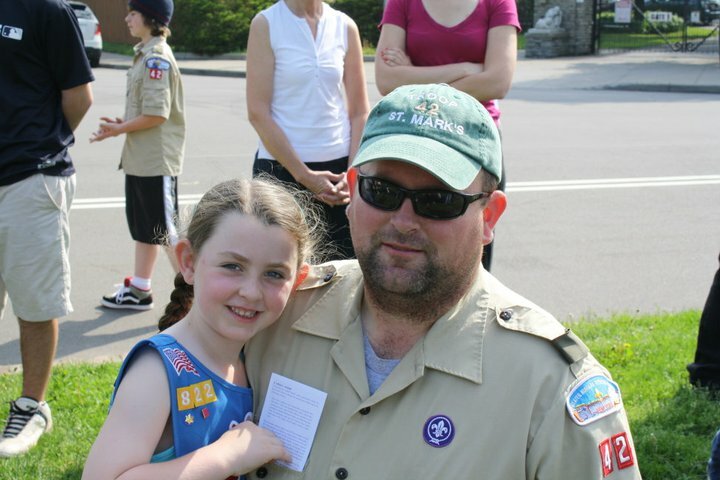 A Memorial Day holiday might involved a chat about the Sabres for Andy Byers, whose love of the team followed him all around the world in service to our country. 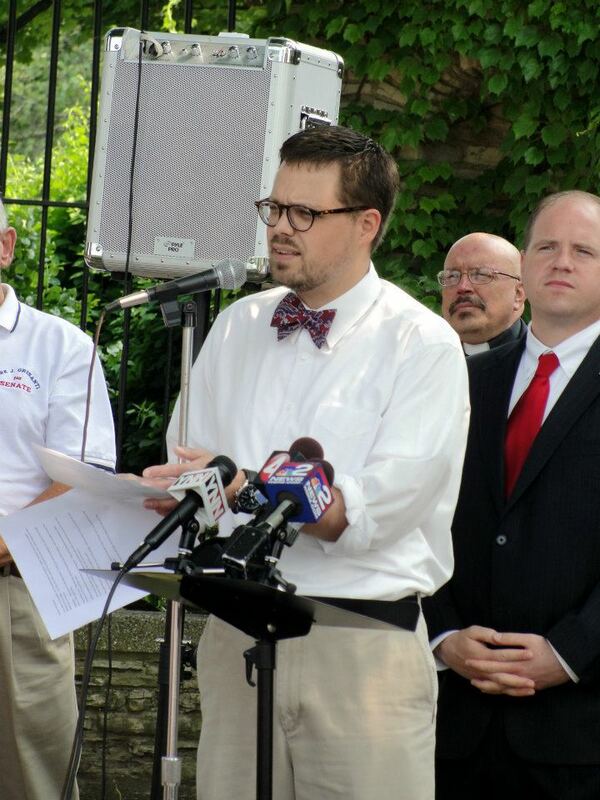 But that service is something Captain Byers knew he wanted to pursue from an early age. It took her some time to accept her brother’s choice of career, but now Lauren looks on her brother’s service and ultimate sacrifice with a mix of pride, devastation, and working to keep the memory of her brother– and all fallen service people– alive. What would Lauren like to see people do on Memorial Day? 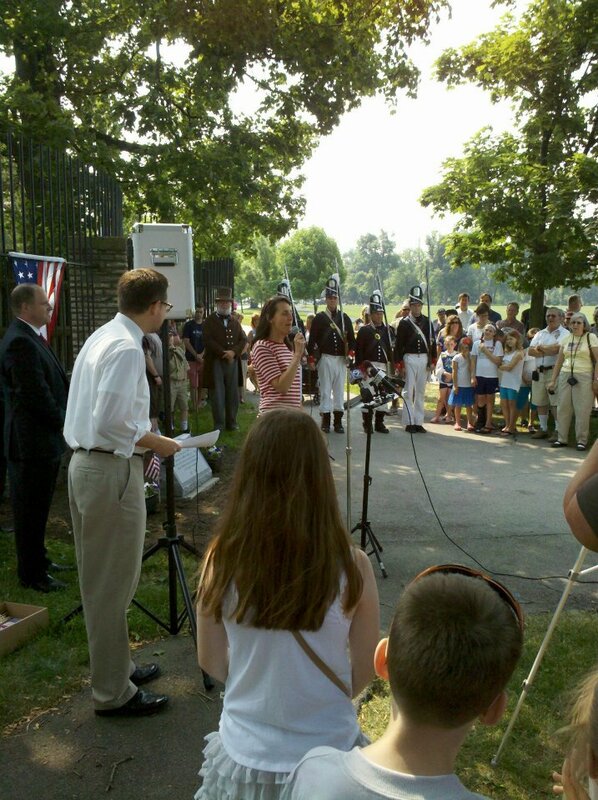 Just remembering those who’ve given their lives for our freedom– including her twin brother. We’re looking at one man’s quest to make sure the memories of the 532 Western New York service members killed in Vietnam live on. Promises of peace came and went several times during the decades that American soldiers were in Vietnam… Peace was fleeting, too, for many if not most of the men and women who returned home from Southeast Asia. “I just didn’t want these men and one woman to be forgotten,” says historian and Vietnam Veteran Pat Kavanagh, who started a huge project and labor of love started with the simple thought. Kavanagh visited dozens of libraries and sent all around the country for microfilms, but the greatest effect was in leaving a small town library, and knowing this is place where this man who was killed in action once walked and made plans for a future which never came. 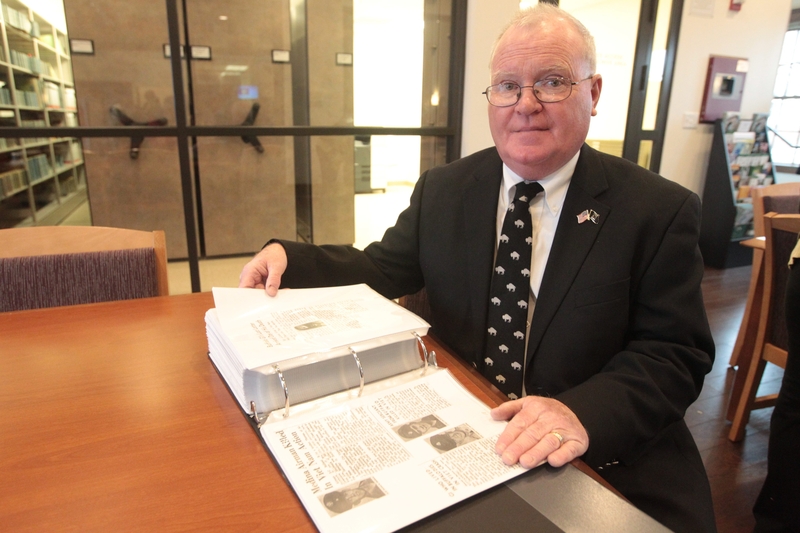 It’s been years since he started the project and Pat feels the collection with remembrances of 532 WNYers killed in Vietnam is as complete as it can be. 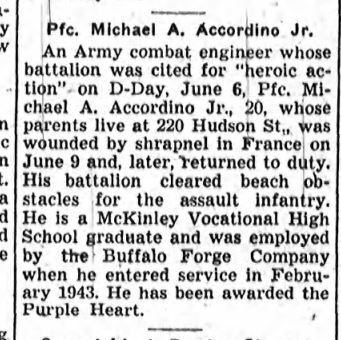 The late Michael Accordino was a member of the 299th Combat Engineer Batallion on D-Day. “For D-Day, we were munition men. We had to build the obstacles on the beach,” said then-Private Accordino in a 2011 interview. He and his mates were under heavy fire as they laid the way for infantry and artillery men to fight their way across and liberate Europe. Accordino’s story is one of survival, but it’s a story he told often through the years so that people wouldn’t forget the sacrifice of the thousands who didn’t make it off of Omaha Beach. The machine gun bullets were landing at my feet. I moved, and a guy raised his sights. He was going to get me, so I turned around and ran back to the obstacle. It wasn’t very big, maybe eight inches of protection. I laid there, and to my right, there were these guys with a big spool of wire, and I wondered what they were doing with this wire. All the sudden, they got hit. I seem them rolling, swaying back and forth. They got hit. I looked like someone threw a mortar in there. I got up, I got the hell out of there, man. I got to the new line, and I just kept on doing my job. Mr. Accordino was awarded the Purple Heart after receiving shrapnel wounds on the beach at Normandy. I spoke to him on D-Day in 2011. He died in 2012. 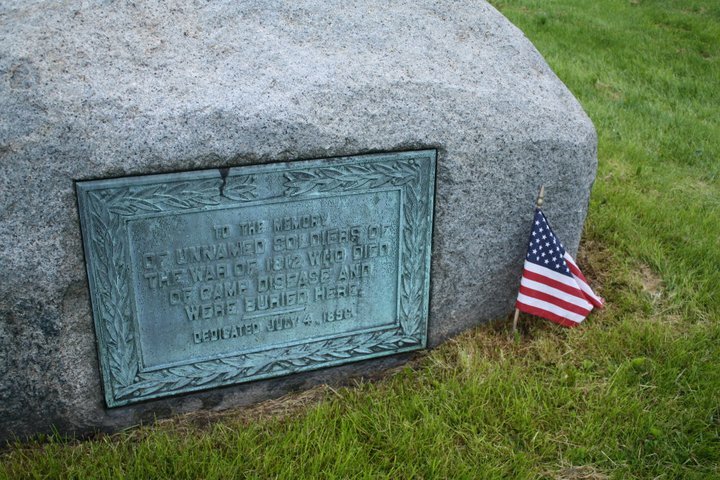 First, it’s the story of Buffalo’s own Tomb of the Unknown Soldiers. 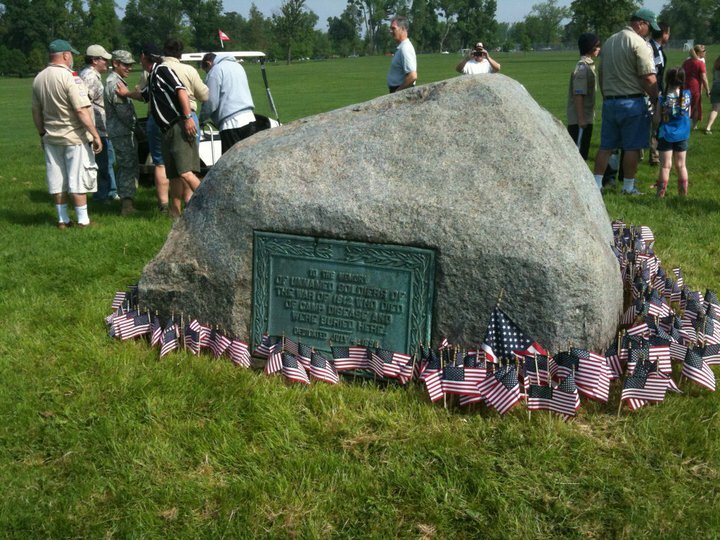 300 US Army volunteers, buried in a mass unmarked grave in the middle of what is now the Delaware Park Golf Course. 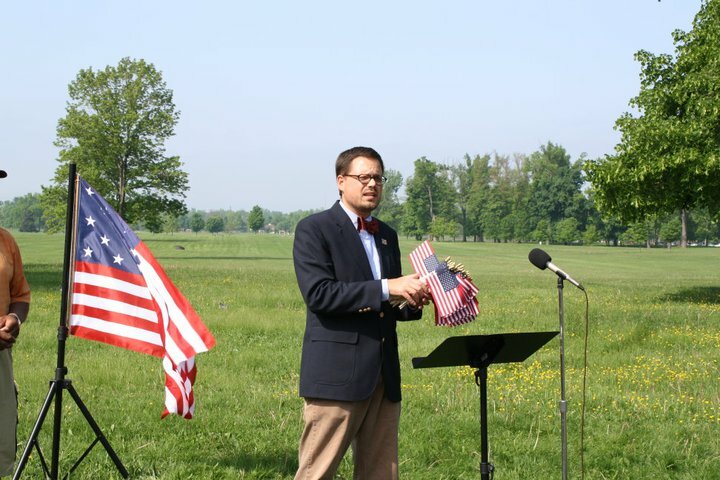 About 300 soldiers, who came to Buffalo to protect our national border during the War of 1812 and died of hunger and disease as they spent the winter of 1814 in tents in middle of what is now Delaware Park– but what was then America’s frontier. But it was volunteer soldiers from Virginia, Maryland, and Pennsylvania who’d marched to Buffalo to invade British Canada and defend Buffalo and Black Rock from invasion. When winter came, they stayed. Wearing light summery uniforms and no winter boots, they lived in open ended tents. It was a particularly brutal winter, and food was slow to make it to the Camp at Buffalo, which was literally the end of the supply line. The food that did make it here was never enough and usually rancid. Soldiers were dying up to ten a day, and with the ground frozen, the dead were first buried in shallow graves, then eventually just left in tents. What was left of the army left Buffalo when spring came, but not before paying for three-hundred coffins and for two local men to bury the 300 dead– which they did, in what is now the Delaware Park Golf course. 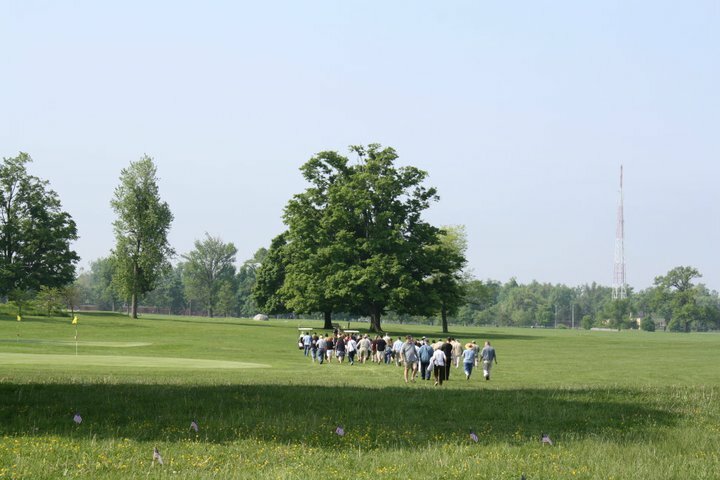 They remain buried there to this day, a bolder in the middle of the golf course marks the spot where the 300 nameless, faceless men, who died here protecting our country, were laid to rest 204 years ago. 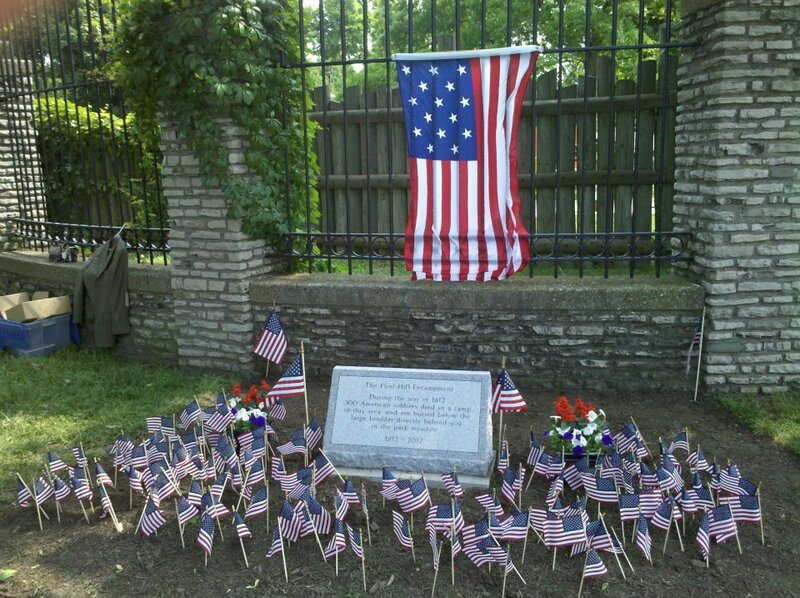 May their noble example and this tribute to their honor and memory prove an incentive to future generations to emulate their unselfish loyalty and patriotism, when called upon to defend their country’s honor, and if need be die in defence of the flag, the glorious stripes and stars, emblem of liberty, equal rights and National unity. When the British burned Buffalo, it was a small village of log cabins, with tree stumps strewn in the streets. 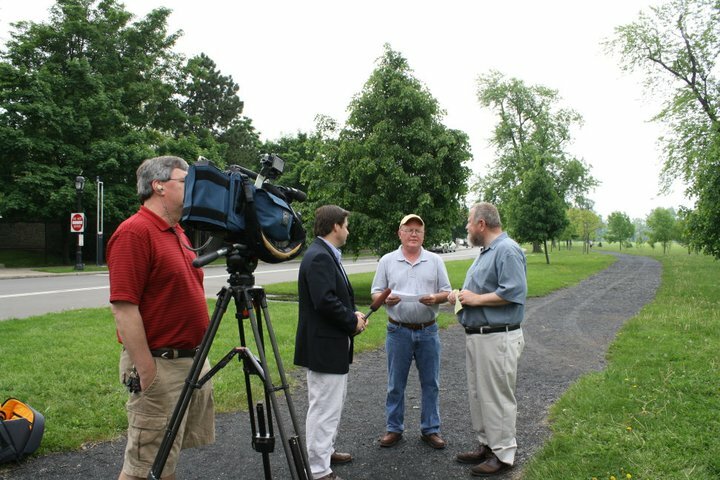 It’s difficult to imagine the Buffalo of 200 years ago, but suffice it to say, the the area that is now Forest Lawn cemetery, the Parkside neighborhood, and Delaware Park, then known as Flint Hill, far outside the tiny village, served as a home base for American troops invading British Canada during the early part of the War of 1812. Roughly half of those garrisoned here never made it home. While the detail of the story follows, and is illustrated in the articles shown to the left, it’s enough to know that basically, after several failed attempts to invade Fort Erie by crossing the Niagara, a decision was made that troops would spend the winter of 1812 at their home base at Flint Hill. These were volunteers, mostly from places like Maryland, Virginia, and Southern Pennsylvania. 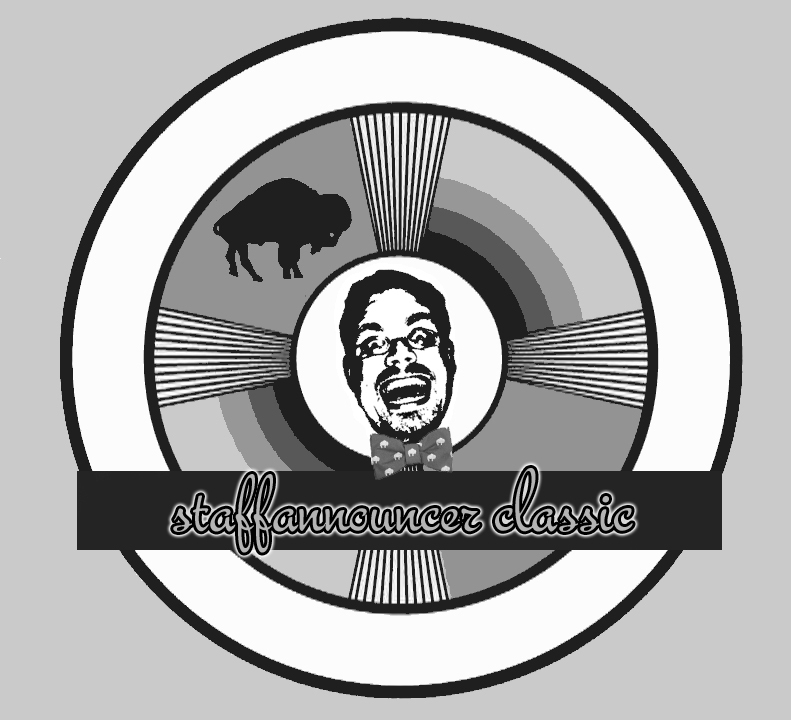 They came to Buffalo in the summer time, with their southern-styled thin linen uniforms. They had open ended tents in which to sleep, and very few blankets. No woollen winter uniforms.No boots. Food was scarce this far out on the frontier. When sickness spread through the camp, called a “dreadful contagion” by the newspapers of the day, soldiers began to succumb. Quickly. 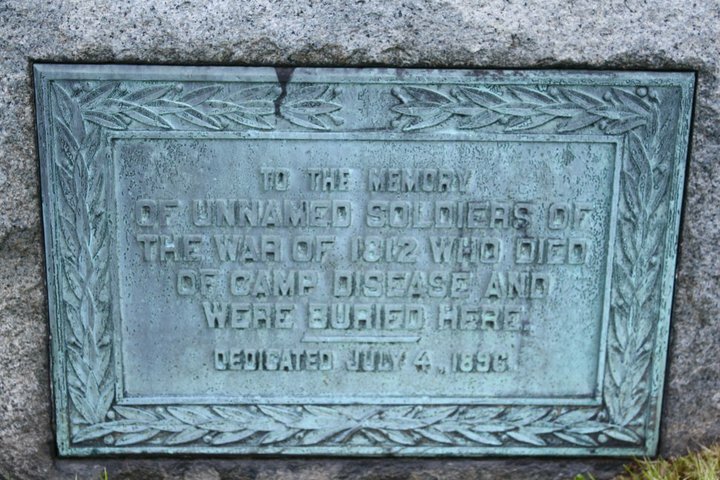 Given the rocky soil of the area, the fact that is was frozen solid in the harsh winter, and the fact that so many were dying so quickly, men were buried in graves around a foot deep on the edge of the camp. In the spring, Dr. Daniel Chapin, upon who’s land they were camped, dug up and reburied all 300 men in a single trench, in an easy to dig meadow in the middle of his expansive backyard. 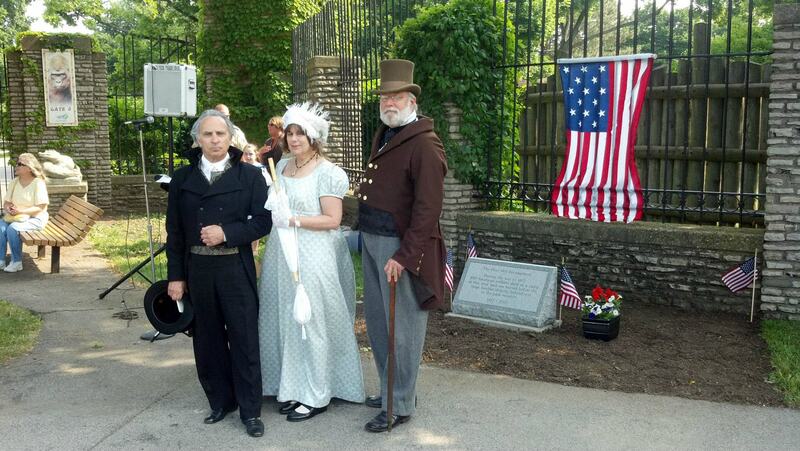 Chapin’s home was at what is now Main Street and Jewett Parkway; his backyard, Delaware Park. 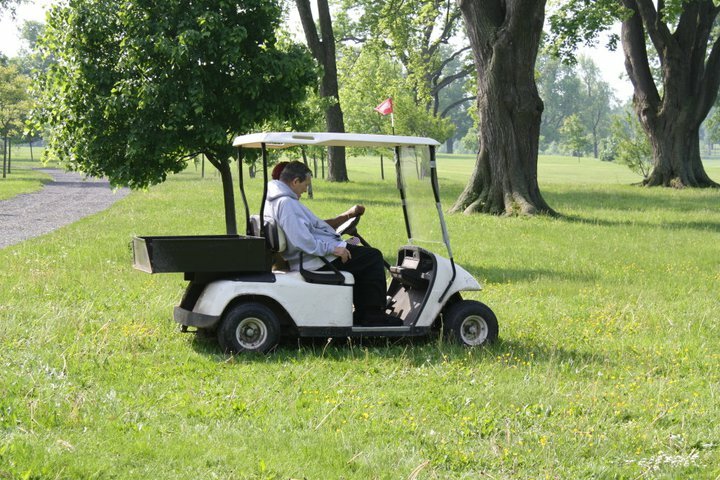 He buried the men in the middle of what is now the golf course, and planted willow trees to mark the spot. When 80 years later, the willow trees began to die, a marker was placed on a boulder, in the middle of what was then the Park Meadow. 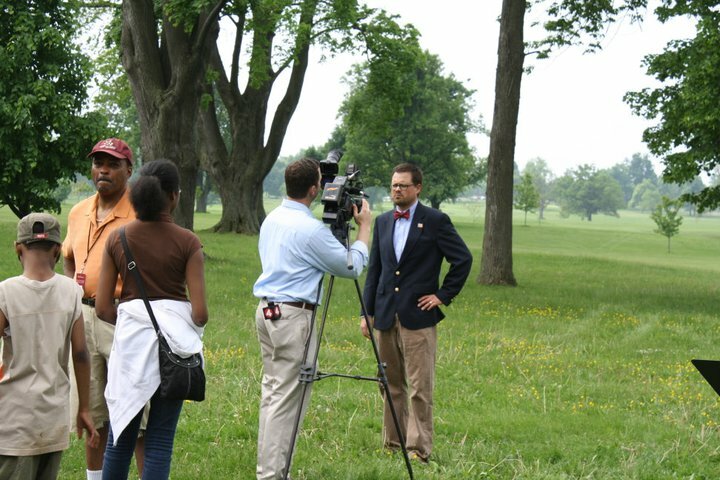 Since then, the hallowed spot, and the sacrifice made by those men to defend our nation have slowly been forgotten; especially as the nation’s first public golf course opened as that game began to sweep the nation just before the turn of the century. 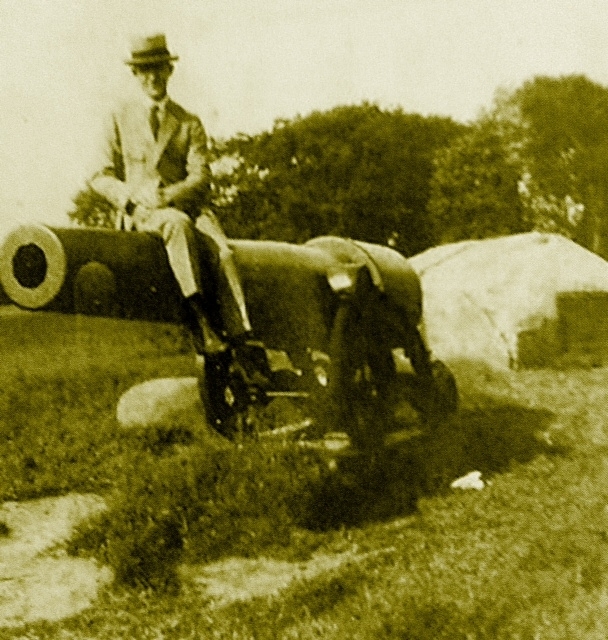 In the 1920s, flappers used the cannons for playful photo backdrops (see left). By the 1940s, “The Cannons” were a well-known and well trodden night spot for teenagers looking to imbibe away from the watchful eyes of grown ups. Ironically, by the late 60s, when the infamous Park Meadow Bar at Parkside and Russell was filled beyond capacity, the overflow crowd often went to the actual park meadow, with a 6 pack or a case to drink the night away. 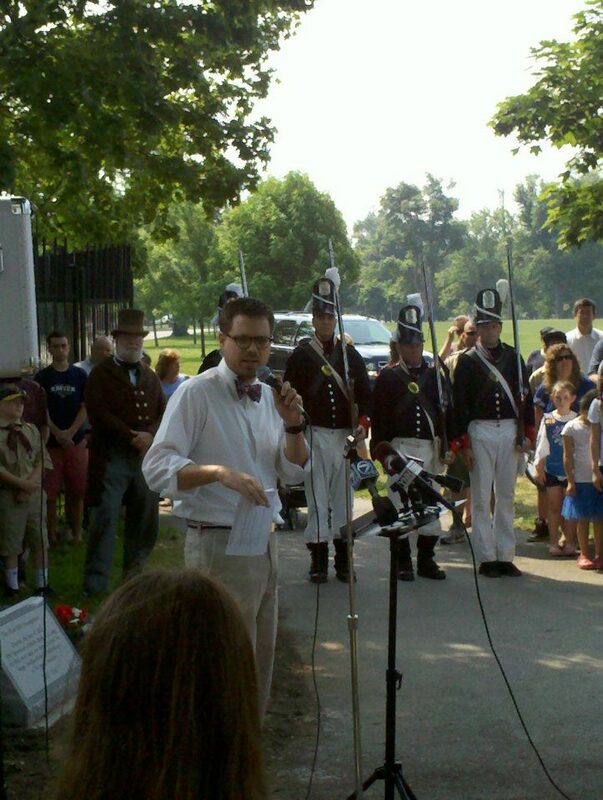 By the late 1990s, renewed efforts by area historians Michael Riester and Patrick Kanavagh began shedding new light on the War of 1812, and the Parkside area’s roll in it. 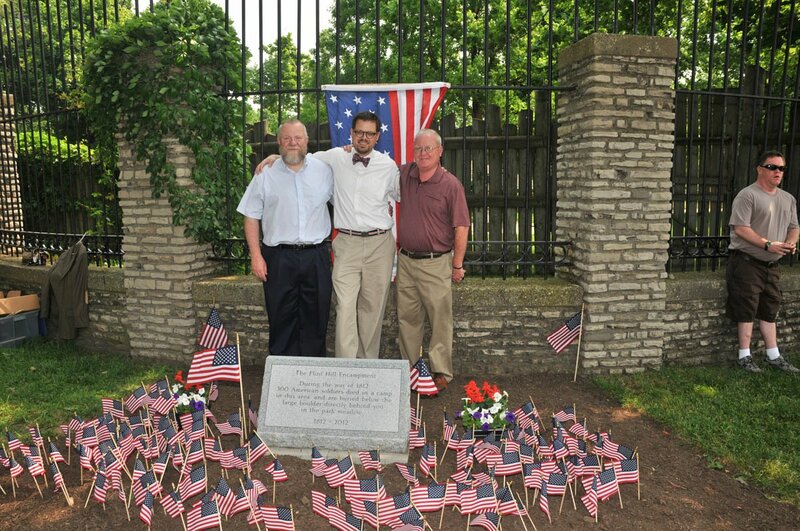 A Flint Hill marker was placed at the corner of Main and Humboldt through the hard work or Patrick and Michael. 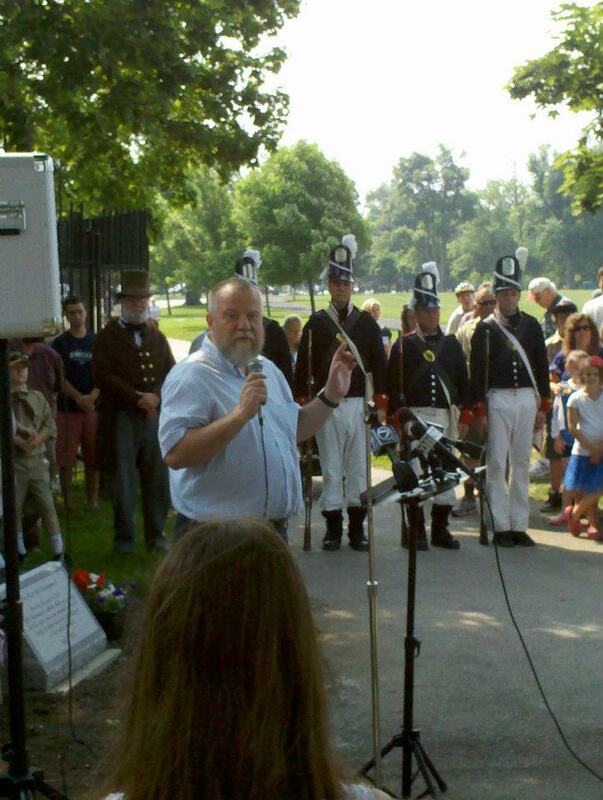 Now, along with fellow historian Steve Cichon, they are trying to call attention to Buffalo’s Tomb of the Unknowns, as the bicentennial of the War looming. 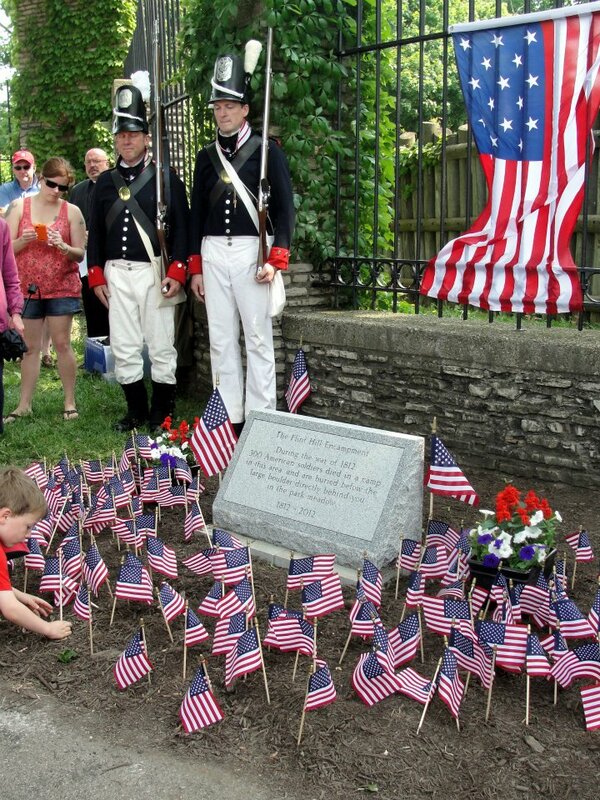 I dedicate it to the memory of those who, during the War of 1812, died from wounds and disease, and whose remains find here repose; who left home and friends, to repel the invasion of a foreign foe; to defend our hill sides, valleys and plains, and who feared not death in defense of the flag. 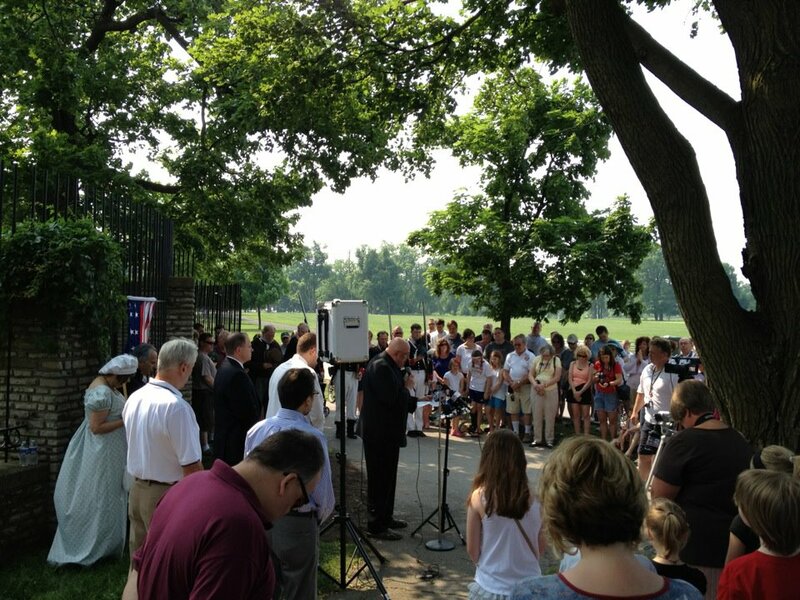 I dedicate this memorial, which will for ages mark their final resting place, to their honor and memory. 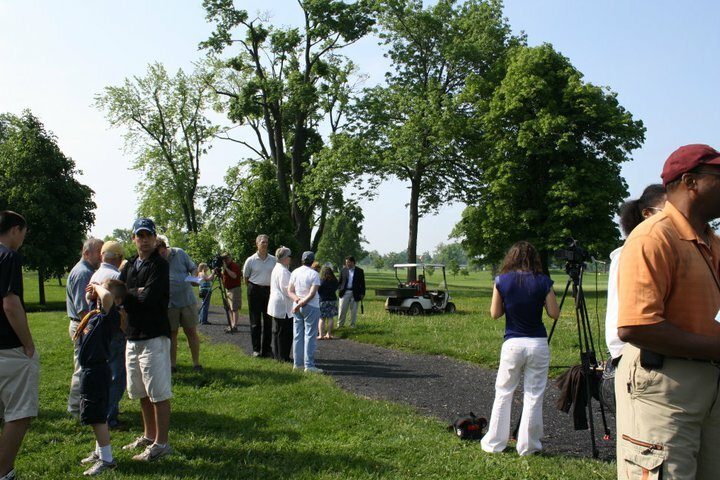 Below, you’ll find two different full accountings of what happened in the Parkside/Forest Lawn/Delaware Park area during the winter of 1812 which left about 300 American soldiers buried in a single trench mass grave, in the middle of what’s now Delaware Park golf course, without any real accounting of who was buried there. Photo from Western New York and the Gilded Age: A Flapper plays on the cannon which once adorned either side of the monument stone. 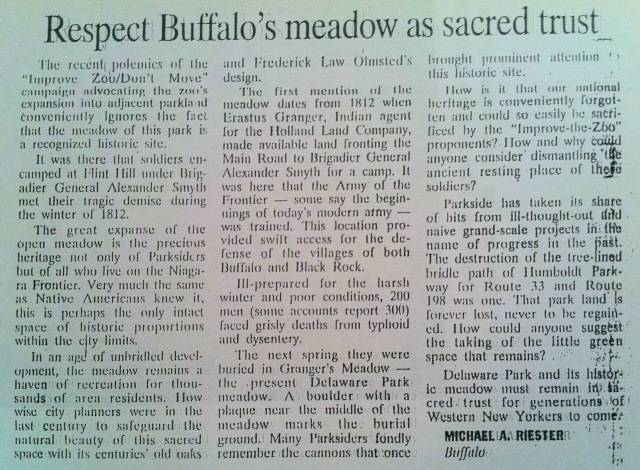 Michael Riester op-ed piece on the Mound in Meadow, with the possibility of moving or expanding the Buffalo Zoo as a back drop. Buffalo News, 1999. 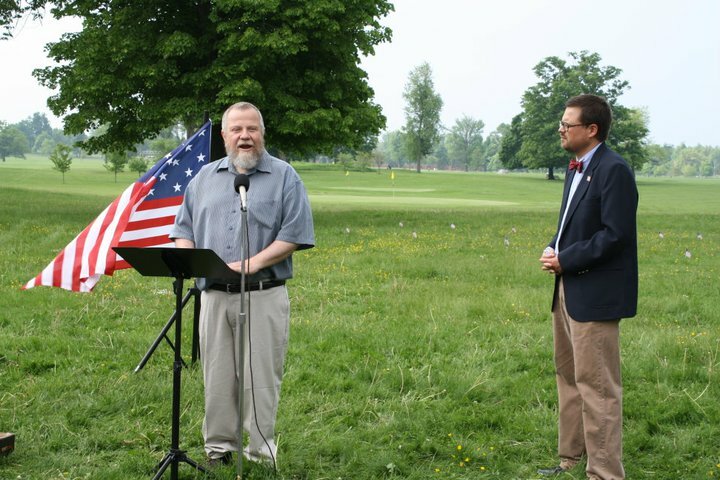 On the penultimate Memorial Day before the celebration of the War of 1812’s centennial, an event was organized to remember the sacrifice of the soldiers who died at the mound in the meadow. 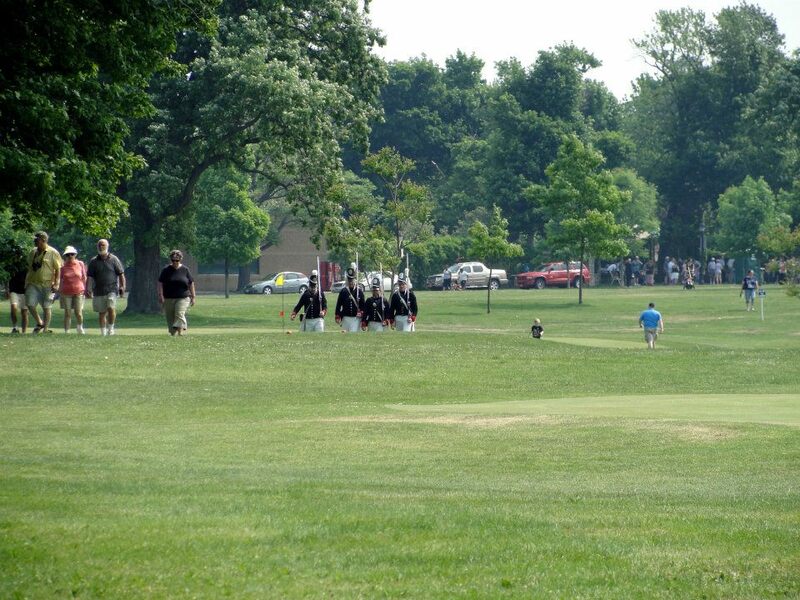 Next time you’re playing the fourth hole at Delaware Park Golf Course, look down and say thanks to the 300 war dead buried there. Better yet, stop and read the small plaque on a nearby boulder, the only physical reminder of the so-called Tomb of the Unknowns. 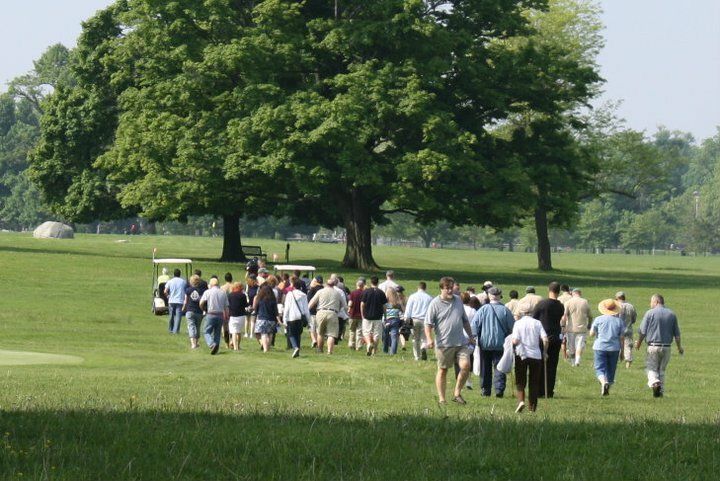 Unbeknown to most visitors, under the middle of the park’s sprawling green meadow lies a mass grave for American soldiers who died of disease and exposure during the War of 1812. 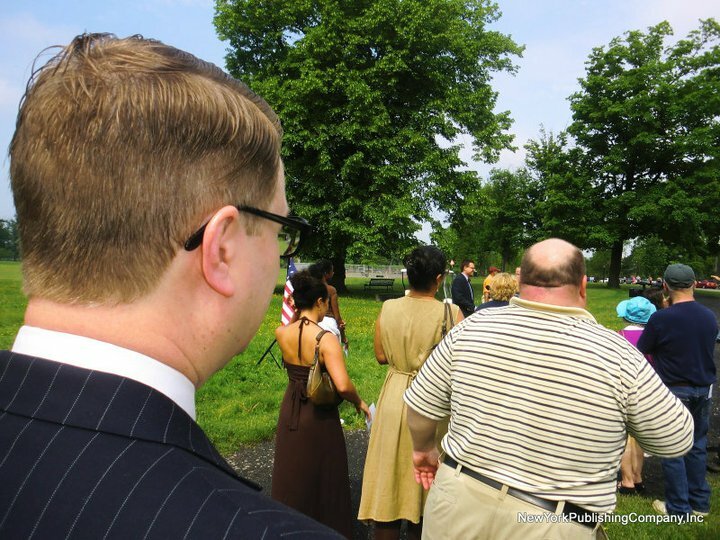 Because of the public’s lack of awareness of the grave, a small cadre of local historians is pushing for a better memorial of the “sacred site” and the men who made the ultimate sacrifice for a young country. 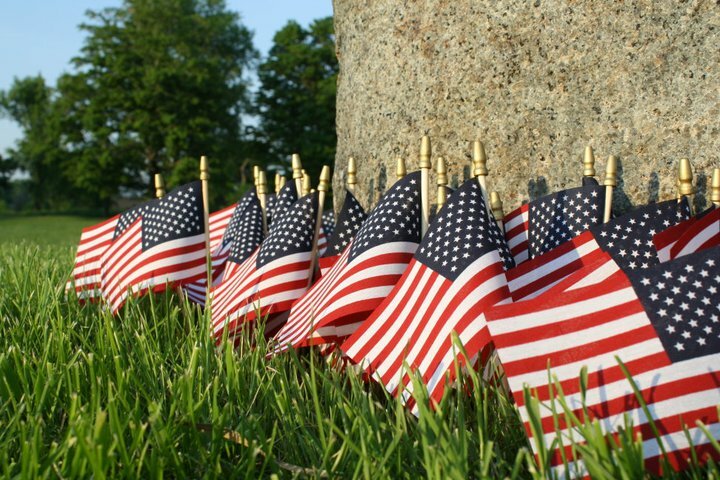 Monday, Cichon will join a group of volunteers in planting 300 American flags at the burial site as part of a Memorial Day ceremony. 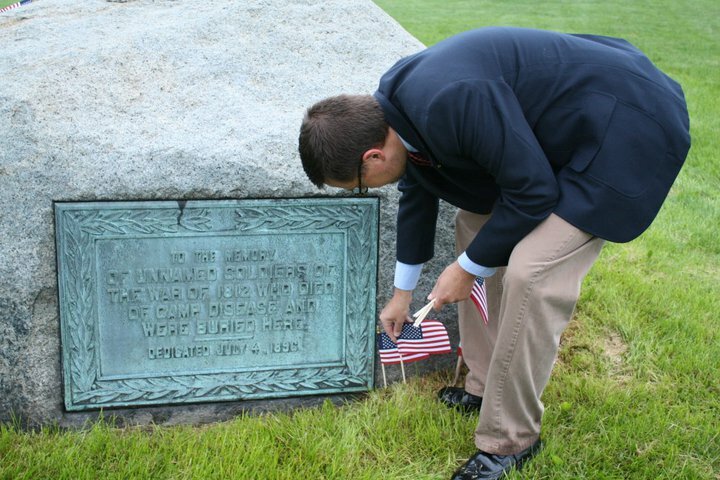 The flags simply are a first step in a larger campaign by activists who think more needs to be done to recognize the grave site and the contributions of the men buried there, many of them volunteers from as far away as Maryland, Virginia and Pennsylvania. 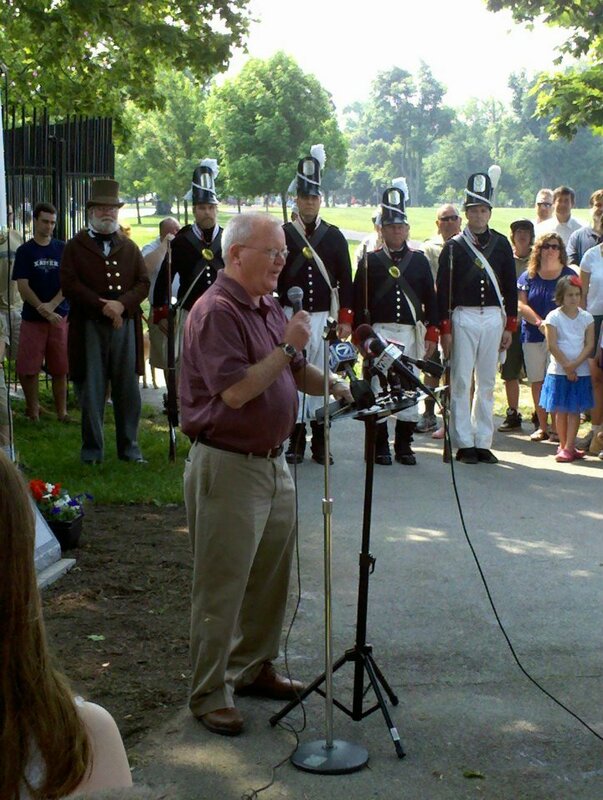 The efforts to improve the memorial coincide with next year’s bicentennial of the war’s beginning and are rooted in a patriotic story of courage and sacrifice by young men ill- prepared for the winter of 1812. 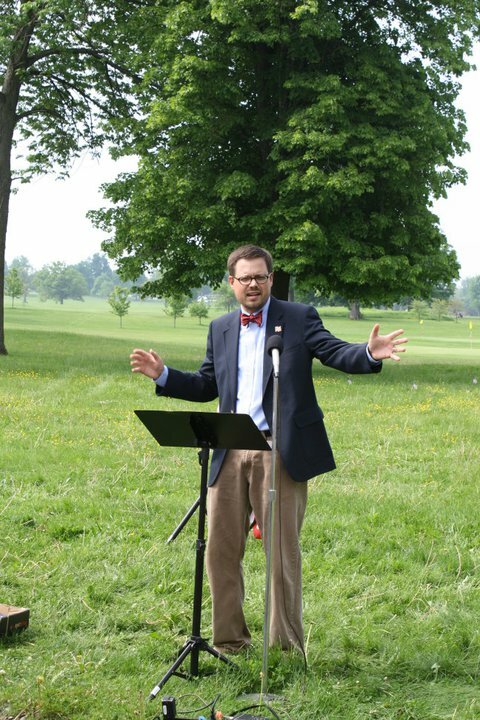 “This is immensely important historically and one of the park’s hidden treasures,” Thomas Herrera-Mishler, president of the Buffalo Olmsted Parks Conservancy, said of the burial site. 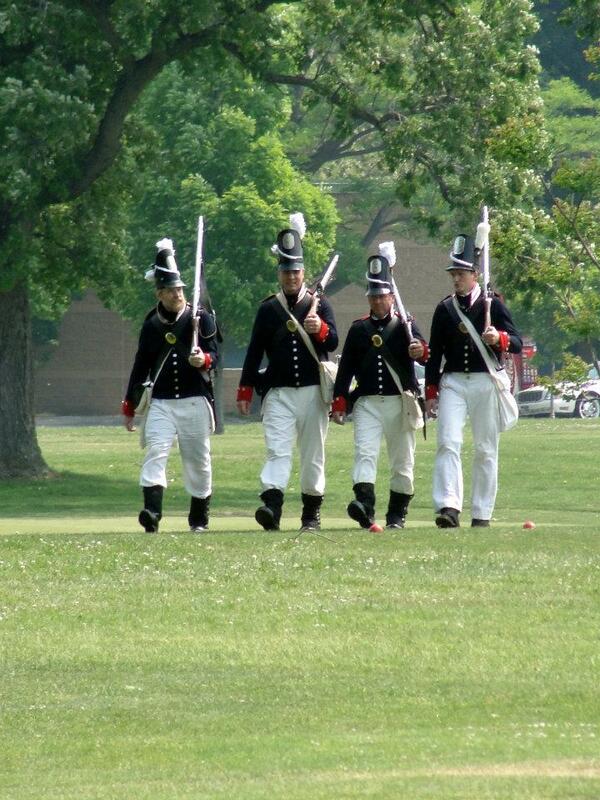 These were American soldiers, who after failing in their attempts to cross the Niagara River and invade Fort Erie, fell back to what was then known as Flint Hill. 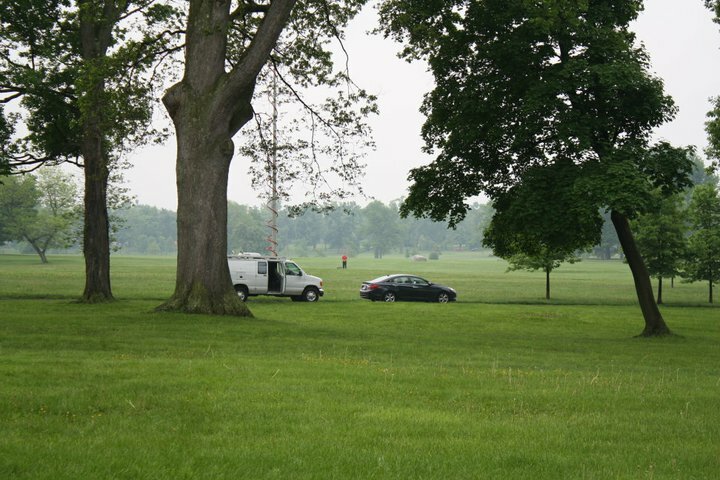 Their camp stretched from what is now Forest Lawn Cemetery to Jewett Parkway and Main Street, and included much of what became Delaware Park. Equipped with warm-weather uniforms and inadequate tents and facing a shortage of food, the American soldiers soon found themselves falling victim to illness and eventually death. One by one, they were buried in shallow graves because of the frozen ground and naturally hard soil. That spring that Dr. Daniel Chapin, who owed the land and lived nearby, dug up the bodies and reburied them in a single mass grave. To mark the burial ground, Chapin planted willow trees. And when the willows died decades later, park officials replaced them with the boulder and plaque that remain there today. 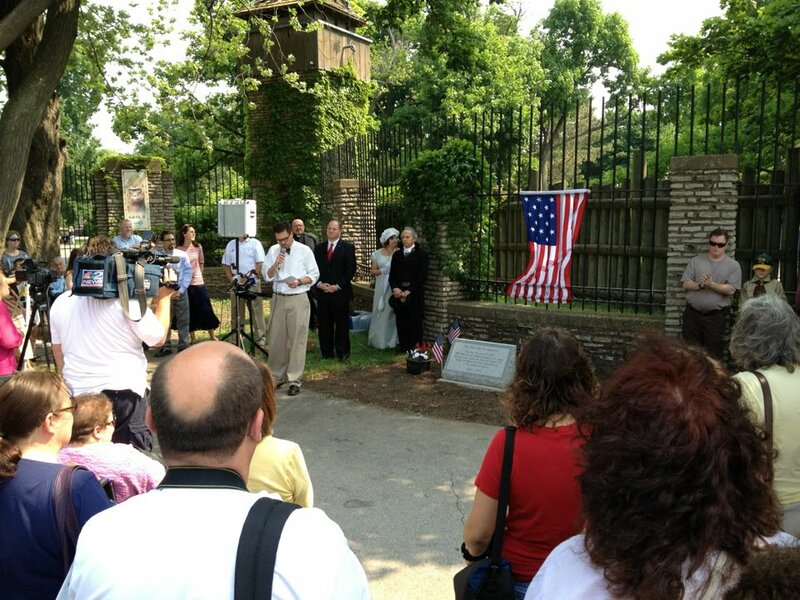 “May their noble example and this tribute to their honor and memory prove an incentive to future generations to emulate their unselfish loyalty and patriotism,” Parks Commissioner David F. Day said in a 1896 speech dedicating the monument. But future generations did exactly what Day said they shouldn’t do — they forgot. 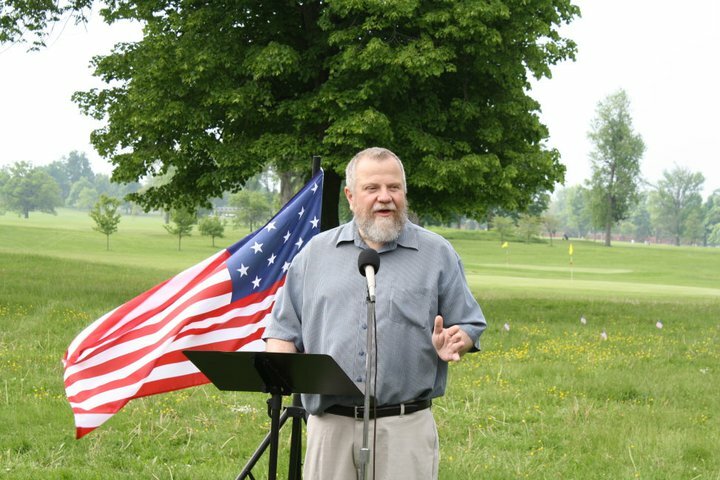 Cichon says he has no problem with the golf course covering the grave site but thinks the monument to the men buried there should be more prominent. Not long ago, two old cannons and a flagpole also sat there. 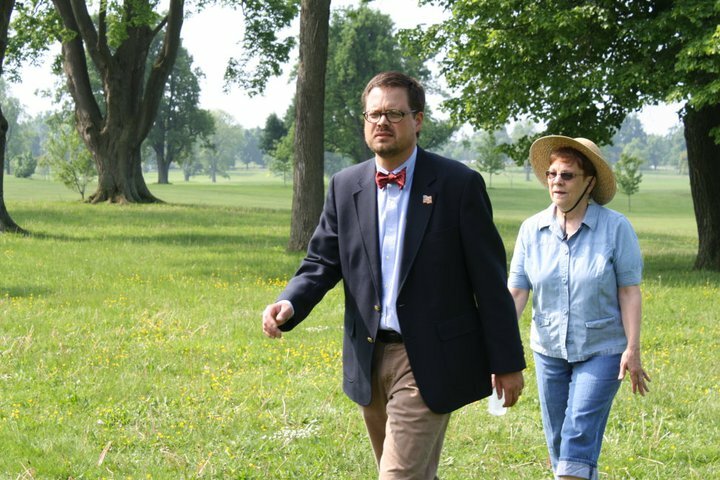 Herrera-Mishler is quick to note that the Conservancy’s master plan for the park calls for adding interpretive signs that document the park’s history and expanding foot trails so they reach the boulder and plaque. For Cichon, Kavanagh and fellow historian Mike Riester, the boulder and plaque fail to adequately memorialize the tremendous loss of life that occurred that winter nearly 200 years ago. 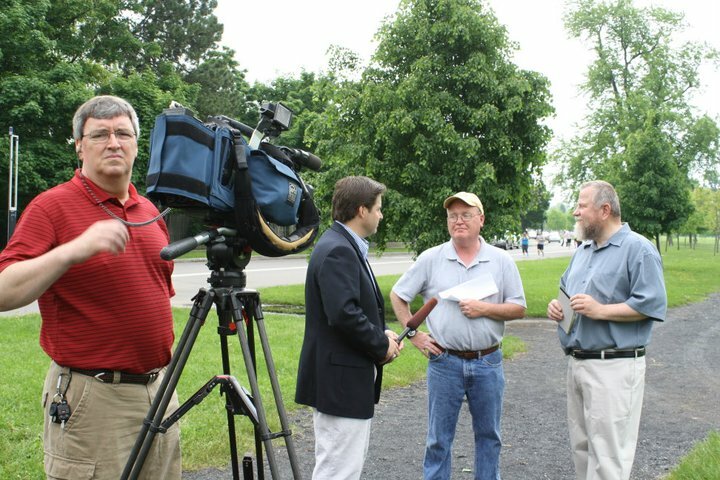 A new memorial would mean everything to Riester, who has been working on this effort for 15 years. “These men are still unknown and forgotten,” he said. “It’s like it didn’t even happen. “I would like to leave this earth knowing this has been fixed, and that these men will always been remembered,” he said. 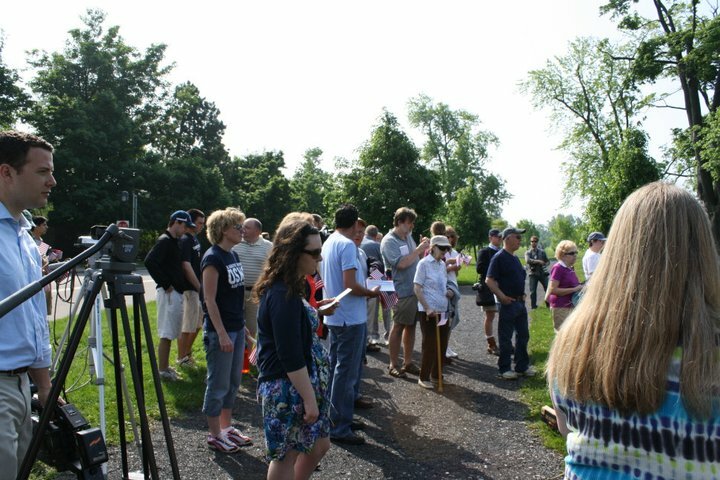 Money was raised over the following year, and a memorial was placed on Ring Road at once of the entrances to the Buffalo Zoo. 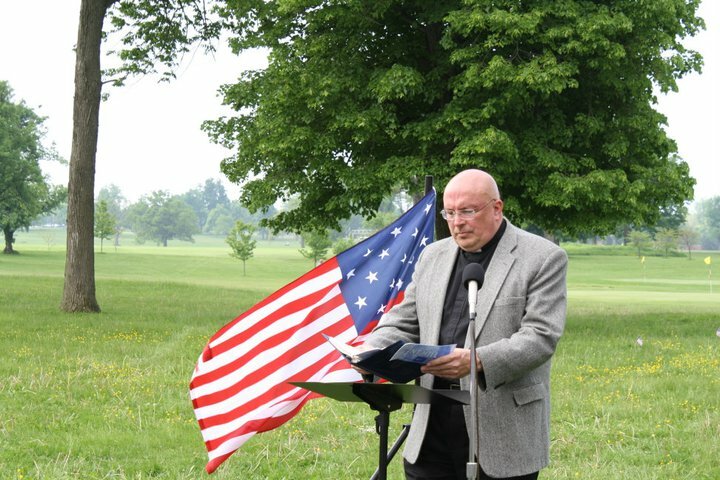 When Steve Cichon learned about the 300 war dead buried in the middle of Delaware Park, he said, it was like a punch in the face. 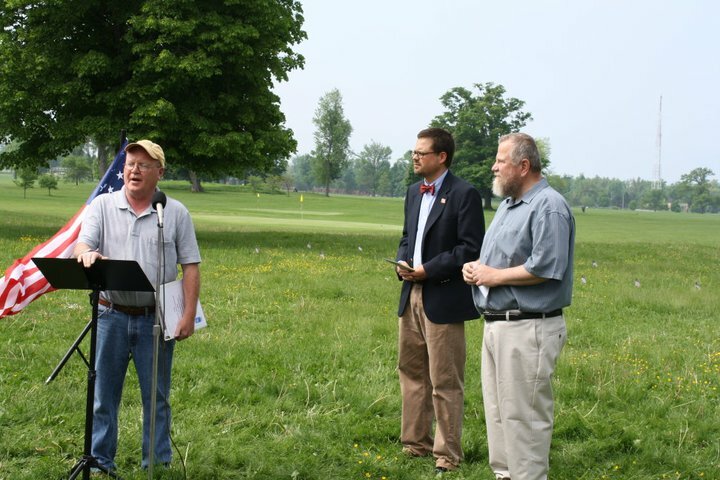 It also struck him that the small plaque on the fourth hole of the golf course, the only evidence of the mass burial site, was a grossly insufficient way of honoring the War of 1812 soldiers who died defending their country. The new monument to the “Tomb of the Unknowns” will be located on Buffalo Zoo property near Ring Road and the zoo’s bison exhibit. 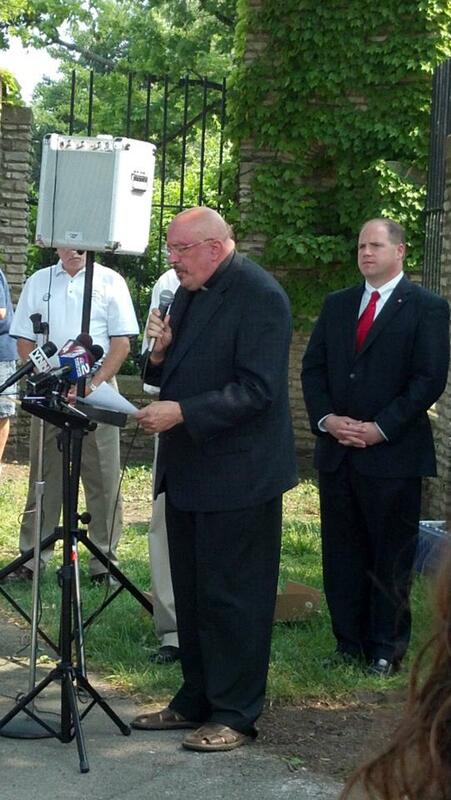 “One quick email and Donna Fernandes said, ‘Yeah, let’s do it,’ ” Cichon said. With the site locked up, Cichon turned his attention to fundraising, and he quickly raised enough to buy a discounted stone monument. 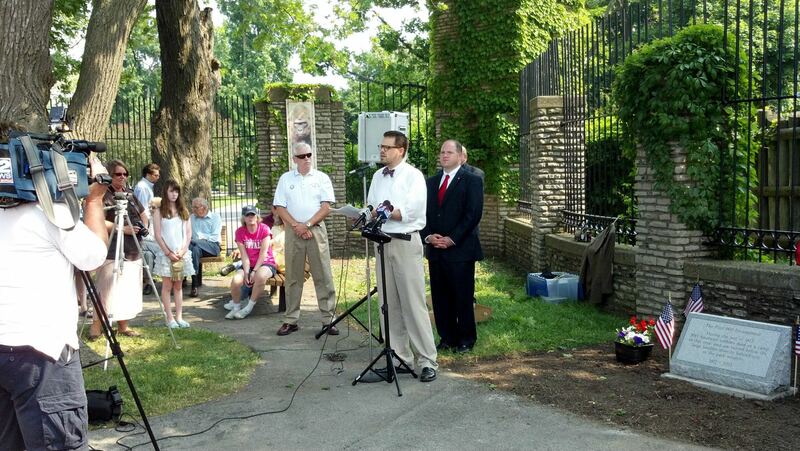 The discount came courtesy of Stone Art Memorial, a Lackawanna monument company that, like the zoo, wanted to help. 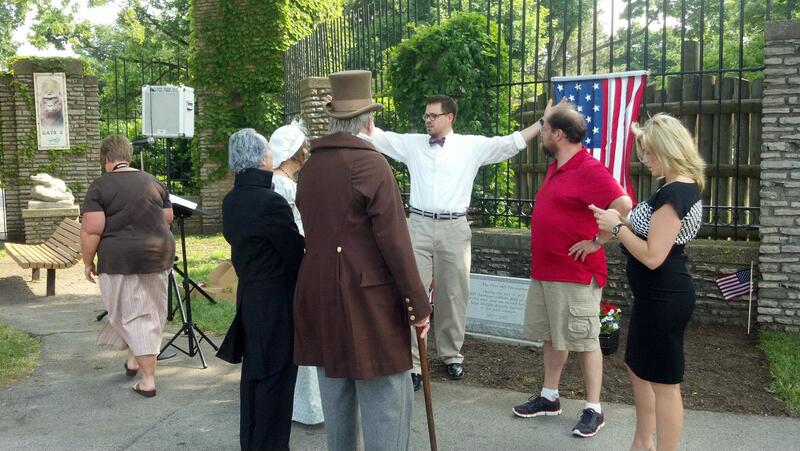 Cichon also persuaded Paul Broad, a local concrete contractor, to help build a base for the monument. More than $1,500 later, he is ready to unveil what he and a small group of advocates have spent years lobbying for — a more suitable reminder of the sacrifice made by the 300 men who were ill-prepared for the winter of 1812. 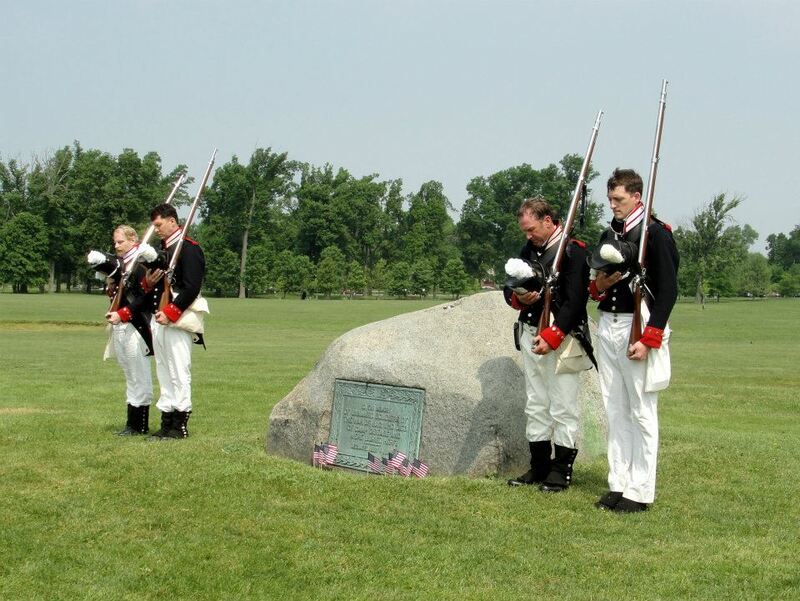 They were American soldiers who, after failing in their attempts to cross the Niagara River and invade Fort Erie, Ont., fell back to what later became known as the Flint Hill Encampment. It covered an area from what is now Forest Lawn to Jewett Parkway and Main Street, and it included much of what is now Delaware Park. Equipped with warm-weather uniforms and inadequate tents and facing a shortage of food, the American soldiers soon fell victim to illness, disease and eventually death. They were buried in shallow graves because of the frozen ground and naturally hard soil, but that spring, Dr. Daniel Chapin, who owned the land and lived nearby, dug up the bodies and reburied them in a mass grave. To mark the burial ground, Chapin planted willow trees. When the willows died decades later, park officials replaced them with the boulder and plaque that remain in place today. “May their noble example and this tribute to their honor and memory prove an incentive to future generations to emulate their unselfish loyalty and patriotism,” Parks Commissioner David F. Day said in an 1896 speech dedicating the monument. Unlike the old monument, a plaque on a boulder in the middle of the golf course, this memorial will be highly visible to anyone walking the park’s Ring Road. It also provides visitors with an easy view of the original plaque and boulder, at the site where the soldiers are actually buried. Chances are, if you spent any time planning for this weekend, it was to make a tee time, get the pool ready for the summer or buy provisions for a cookout of grilled hamburgers and hot dogs. We’ve long treated Memorial Day as the unofficial kickoff to summer ? a last-Monday-in-May, guaranteed three-day weekend ? while forgetting why we observe the holiday. But it’s not too late, even if you just take a moment today to recognize the sacrifices made by those who died at far too early an age in the service of their country. For more than two centuries, families from this area have sent off to war teenagers and young adults, some not old enough to legally drink, only to see too many of them return in a coffin. 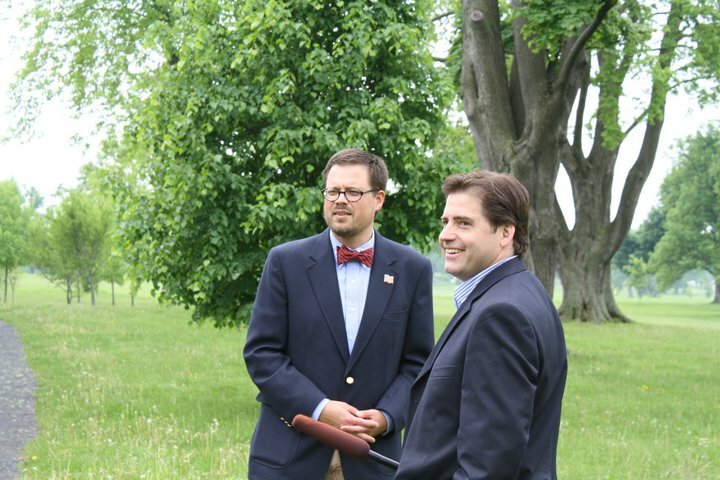 This year marks the bicentennial of the start of the War of 1812, which saw bitter fighting here, including the burning of Buffalo and other Niagara Frontier villages. 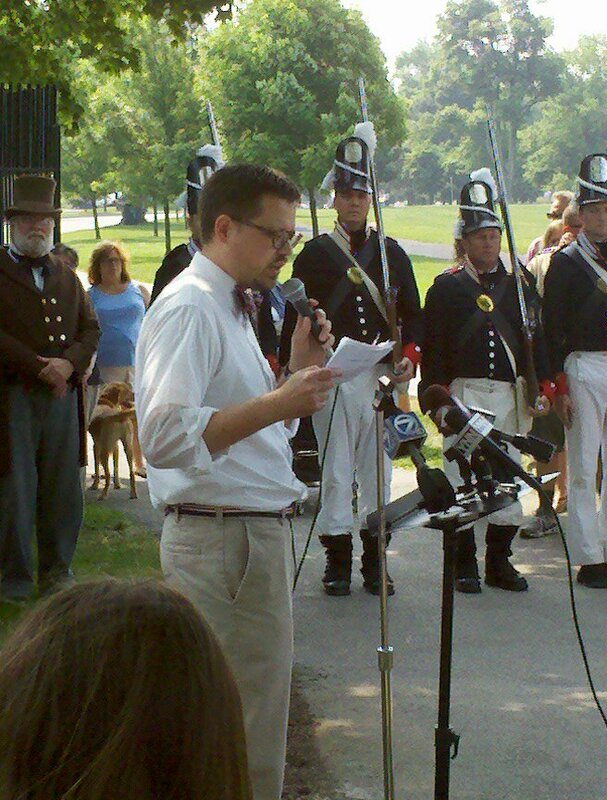 Some 300 soldiers in that war died while camped in what is now Delaware Park. They are buried there in a mass grave. 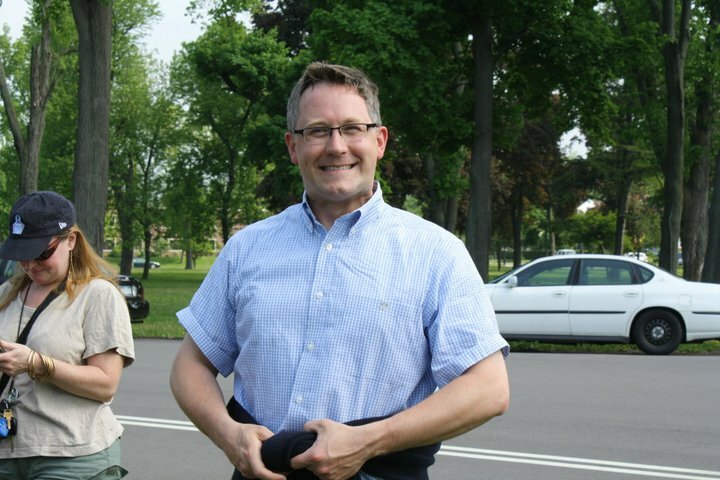 So it is fitting that a memorial to the “Tomb of the Unknowns” will be unveiled today, near the Buffalo Zoo, by Steve Cichon, a local radio reporter and historian who led the effort to better recognize the 300. 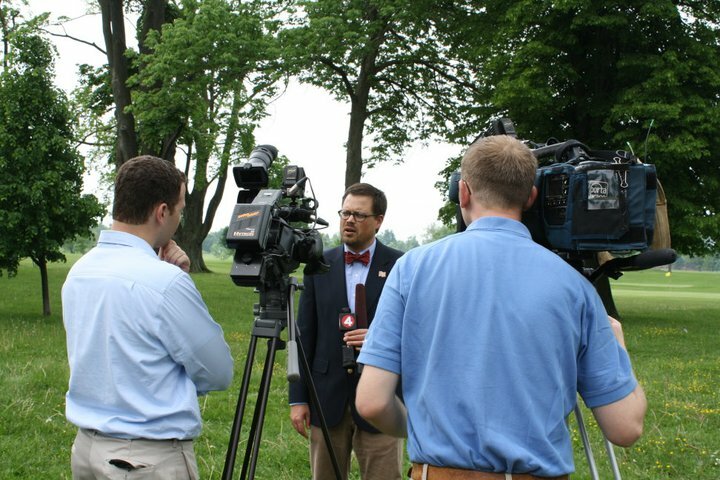 For the past year, Buffalo Niagara has joined the rest of the nation in marking the 150th anniversary of the Civil War, our nation’s bloodiest war. 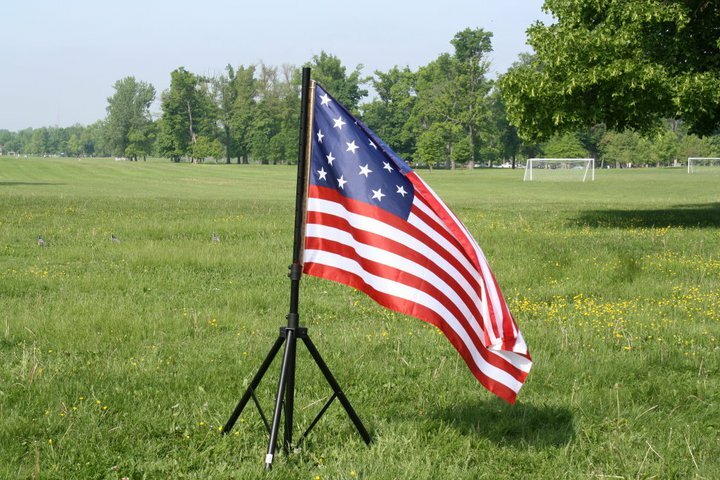 It’s only fitting that our attention turns back to Fort Sumter, Antietam, Gettysburg and Appomattox, because Memorial Day traces its origins to Decoration Day, a holiday established in 1868 to honor the dead from that war. But we don’t have to look to the history books, or stoop to peer at the fading words on a long-dead soldier’s crumbling tombstone to recognize the sacrifices made in the name of the United States of America. This is the first Memorial Day observed since the withdrawal, in December, of the last U.S. combat troops from Iraq, where 4,486 American servicemen and women died since that war began in 2003. We continue to wage war in Afghanistan, where Americans have served since October 2001, making it by far the lengthiest war in U.S. history. The American death count for that conflict is nearing 2,000, and coalition forces will continue to press the fight against the Taliban there through the end of 2014, President Obama and his NATO allies said last week. We will leave Afghanistan as we left Iraq, without declaring victory, mourning the dead and, while hopeful, worrying what will happen after we’ve departed. Unlike in previous conflicts, the general public hasn’t been asked to make much of a sacrifice during the wars in Iraq and Afghanistan, so the burden has fallen disproportionately on the servicemen and women and their families. But we can take this one day to make a gesture to honor those who paid for our freedom with their lives. 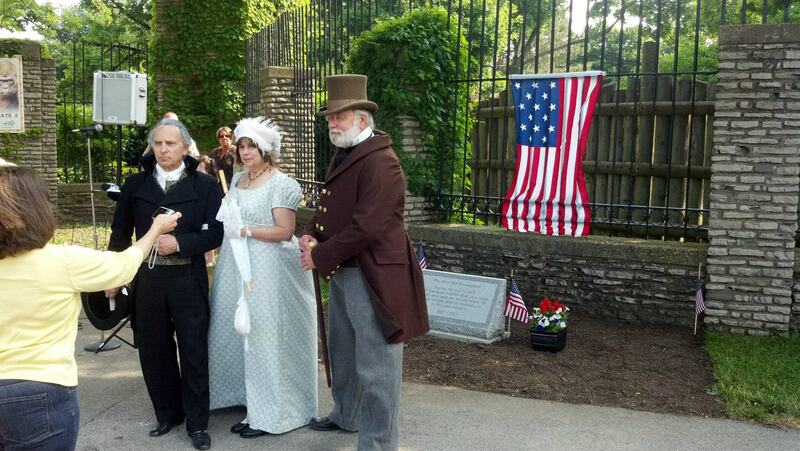 Display the flag, attend a Memorial Day ceremony, tend the grave of a fallen veteran or take your children to a parade ? but spend a few minutes explaining why we’re having a parade today. Erastus Granger had been at Flint Hill less than a decade; the Plains Rangers less than five years when the War of 1812 broke out. 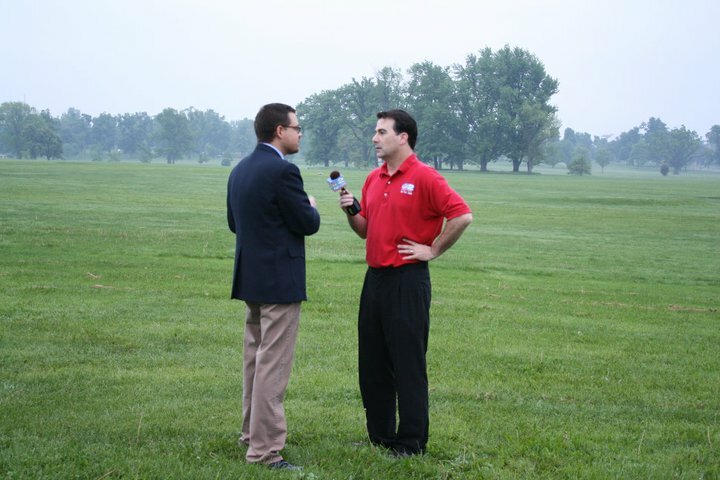 The Parkside/Flint Hill area played several prominent roles in that conflict. Flint Hill was an encampment and training ground for soldiers preparing to invade Canada. 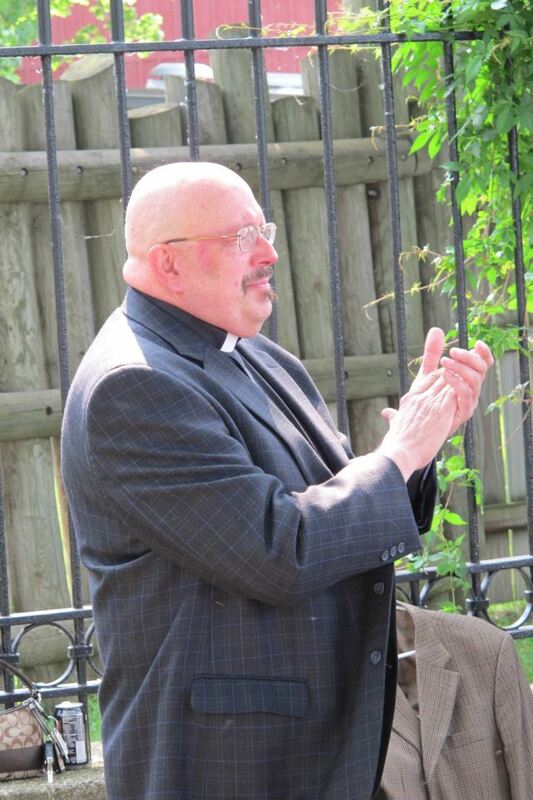 It was also a sanctuary when the village of Buffalo was burned to the ground. 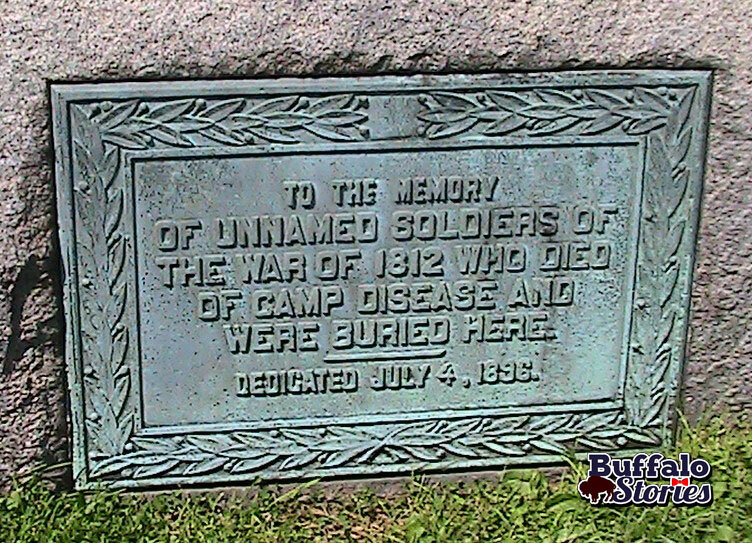 Given the nature of war and brutal Buffalo winters, the area also served as a burial ground for hundreds who never made it home. 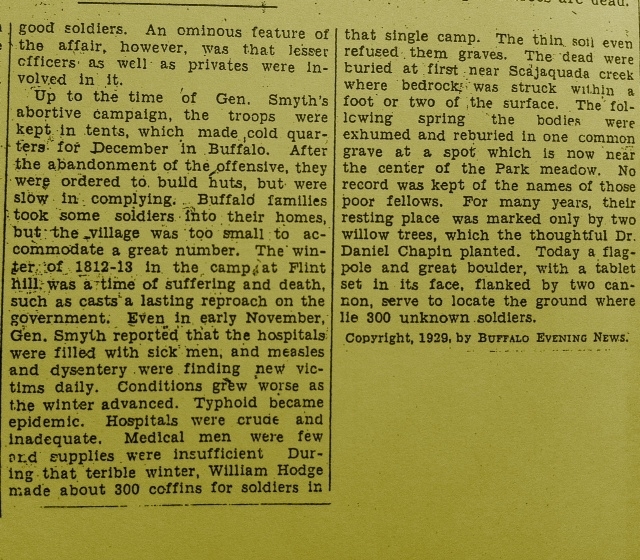 Throughout much of the documentation about the War of 1812, the Flint Hill Camp was described as “Camp near Buffalo.” This was explained in Peace Episodes on the Niagara (Buffalo Historical Society, 1914). 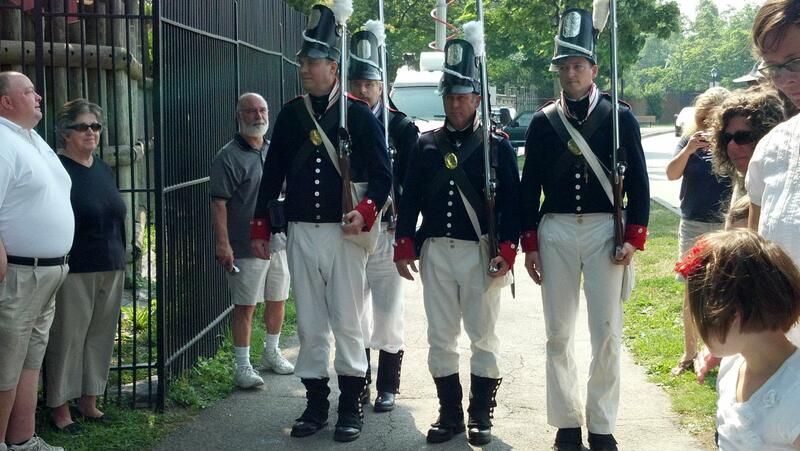 “In 1812, the Army of the Frontier went into winter quarters at Flint Hill, with Scajaquada creek as a convenient water supply.” Barton Atkins, the great chronicler of history of this period, wrote about the encampment in Modern Antiquities: The camp extended on Main Street from the present Humboldt Parkway northerly to the lands of Dr. Daniel Chapin… and westerly to the head of the Park Lake, on lands belonging to Erastus Granger. On the Main-street front of this old camp-ground stand several venerable oaks, relics of the old camp. The one directly opposite the Deaf and Dumb Asylum is distinguished as the one under which a row of soliders kneeled when shot for desertion in the spring of 1813. Flint Hill, along with the rest of the Niagara Frontier, was a hotbed of activity early in the war as a planned launching point for the invasion of British Canada, and as it was Indian Agent Granger’s job to keep the Native Americans neutral. The Buffalo Gazette of June 2nd, 1812, reports Granger met with the chiefs of the Six Nations, at which time they acknowledged no desire to enter conflict between the US and Canada. By early August however, after the rumor spread of the British and their Indian Allies gaining control of Seneca-owned Grand Island, Seneca chief Red Jacket told Granger that the Seneca Warriors wished to join the conflict against the British and “drive off those bad people from our land.” As his correspondence from the time shows, Granger spent much of the ensuing year walking a tightrope, trying to make both the Indians and the powers in Washington happy. Though it was the continued hope to keep the young men of the Six Nations neutral, given the fact that “within a fortnight, between two and four hundred savages” would be in Buffalo ready to fight, President James Madison was forced to allow Granger to accept the services and organize the warriors of the Six Nations. Still, there were many stops and starts in the Iroquois joining the war effort. Several times, after being asked to assemble, native warriors weren’t used. After nearly a year of “dancing” between native chiefs and Washington bureaucrats, the two sides kept in alliance by the constant work of Granger, it was Granger’s safety that ultimately had the Indians take to arms in combat. They finally entered the conflict when their friend, Erastus Granger, was in peril. The Canadian British put a price on his head, and had Flint Hill… yes, modern day Parkside… marked for destruction. Judge Granger received word of this on July 10, 1813, and sent word to the greatest Seneca warrior of his time, the old chief Farmer’s Brother. Granger’s longtime compatriot, who fought in both the French and Indian War of the 1760s, and the American War of Independence, had received a medal from George Washington for his service. It was also “from Washington’s lips” that came the name “Farmer’s Brother,” by which the chief would be known for the rest of his days. A man of at least 80 years old in 1813, Farmer’s Brother traveled from his hut in the Indian village in today’s South Buffalo, to what’s now the Parkside neighborhood, with warriors in tow, ready to fight. The Indians readied for war at the Granger home on Main Street. James Granger wrote an account of the night in his 1893 book Granger Genealogy. The chief and his followers arrived at 11 o’clock, and the night was spent preparing for the coming fray. Bullets were molded by the great fire in the kitchen (of the Granger Homestead), messengers hurried into the neighboring village for arms and ammunition, and the Indians were banqueted on unlimited salt pork prepared by Mrs. Granger’s own hands. After over a year of waiting to join the conflict, the Senecas would finally join the war. Granger, led by Farmer’s Brother and the Senecas followed Guide Board Road (North Street today) to Black Rock. There, they met with General Porter, who decided to initiate an offensive against the British along the shores of the Niagara River. The Senecas prepared for battle in a ritual never seen by the American troops assembled at the spot. They took of all of their clothes; stripped down to their breechcloths. Granger and the Senecas were on the right side of the line, regulars in the middle, white volunteers to the left, ready to take on the British. At the order of General Porter, the Indians leapt forward with a yell that startled both their enemy… and their allies. Within minutes, the enemy had retreated. The Indians had even rushed into the water to pull soldiers from their boats as they paddled in retreat for the safety of the Canadian shore. The victory was complete. Buffalo, Black Rock, and Granger’s Flint Hill Estate were safe, for now, due mostly to the tenacity of Farmer’s Brother’s men. Because of its location, both high in elevation, and a relatively safe-yet-close-enough distance to Black Rock, Flint Hill had become an important meeting place for the military leaders both the United States and of the Six Nations (now Five Nations, with the Mohawks fighting along side the British.) Captain George Howard of the 25th Infantry spent some time at the Granger place recovering his strength and health. He wrote home to Connecticut on June 6, 1813, that he had met many of the famous chiefs of the Six Nations, including Red Jacket, Parrot Nose, Bill Johnson, Young King, Farmer’s Brother, and Silver Heels. 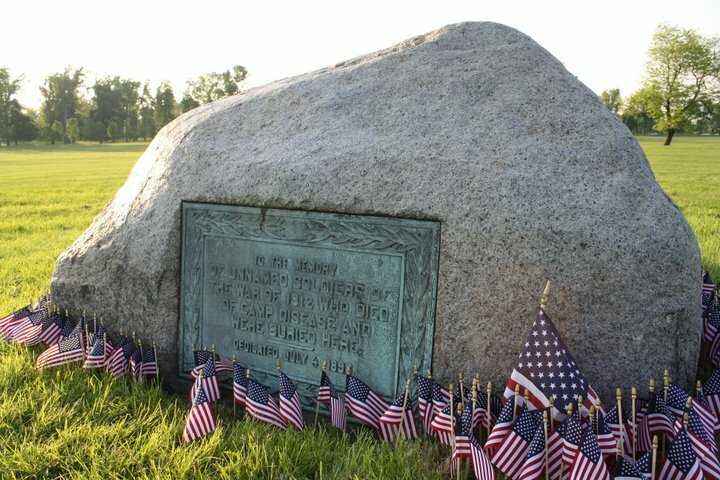 Five months after that first battle, in December, 1813, by now Col. Granger and 83 Seneca Warriors under his command again responded to a British attack on Black Rock, but this time, they were forced to retreat when so many other soldiers fled from the line. Granger returned to his home, several miles away, to relative safety. As hoards of men retreated, and the lines of protection broke apart, the British marched up Niagara Street from Black Rock to Buffalo, and over the course of the coming days, laid torch to all but a handful of buildings in the village of Buffalo. Picture Delaware Park, all along the Scajaquada Expressway, over the Park Meadow and golf course, all the way up to Main Street filled with tents, bonfires, and soldiers milling about. As early as September 1812, over a year before the burning of Buffalo, General Alexander Smythe had planned to use Buffalo and Black Rock as a staging ground for an invasion of Canada; many of his troops, particularly Pennsylvania volunteers under the command of General Adamson Tannehill, were camped and drilling at Flint Hill. After this a number of the young men of the town kept watch at night. Of this group Velorus Hodge was one and they kept watch one night at the bridge of Granger’s creek, Main street. (This is roughly the intersection of Main Street and Jefferson Avenue.) After a while the one on guard outside discovered eight soldiers crossing the bridge, and hailed them. They answered, “What businesses have you to stop soldiers on the march?” and then a pistol was fired by one of them. The guard returned the fire. This started out those in the house; they sallied forth and all fired at the soldiers giving them an effectual peppering with shot. Five of the soldiers fell to the ground and three making their escape. Of the five four were wounded by the shot; the fifth fell to save himself from being shot. These five were marched into camp the next morning and delivered over to the commanding officer, who approved of the course taken by the citizens. This put a check upon the stealing and plundering for quite a while. Plainly, his troops hated him. General Smythe wrote many verbose and bombastic proclamations to his troops, and verbally delivered several more, most of which won him “the derision of friend and foe.” He was known as “Alexander the Great” and “Napoleon the Second.” Plenty of his hot air was blown in preparation for his plans to invade Canada. Those plans were set into motion on November 28, 1812. Smythe had as many as 8,000 men champing at the bit. He had been building, collecting, and fixing boats by the dozen for crossing the Niagara River at Black Rock. At this point, Smythe’s rhetoric had worked, whipping his men into a frenzy, ready to spill across the river at Black Rock for the glory of the union. Trumpets played Yankee Doodle Dandy, further lighting the fires under the men on a cold winter day, with wind and snow blowing off the Niagara River. An early morning crossing of 420 men in 21 boats were met with musket fire as they approached the shore to the south of Fort Erie. What happened next was the final straw for Smythe’s men. What happened… was nothing. From sunrise to late afternoon, his army was embarking- the enemy on the other side of the river, in constantly-increasing numbers, looking on at the show. General Smythe did not appear at all, leaving the details to his subordinates. For hours the troops shivered in the boats, some of which, stranded on shore, filled with snow and ice. Late in the day, when at length everything seemed ready for a grand movement across the stream, General Smythe issued an amazing order: “Disembark and dine!” Disgusted and angered, the whole force was at the point of rebellion. Two more days of similar commands to climb aboard boats… spend the day in the tiny wooden craft, freezing along the Niagara River shore in late November Buffalo weather, and then never leaving that snow and ice- filled shore. After having been “whipped into a frenzy” days before, some men smashed their muskets against trees in disgust, and many of those who didn’t ruin their guns made mutinous use of them, firing in the direction of Smythe himself. 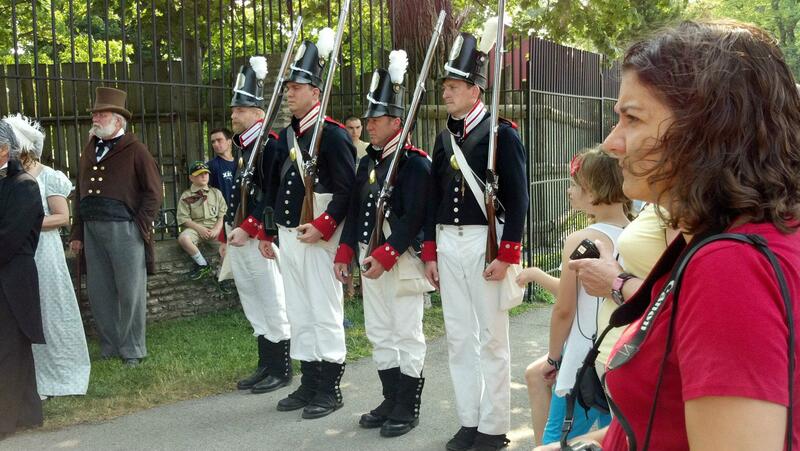 Legend has it that musket ball holes filled General Smythe’s Flint Hill tent by the end of that third night. 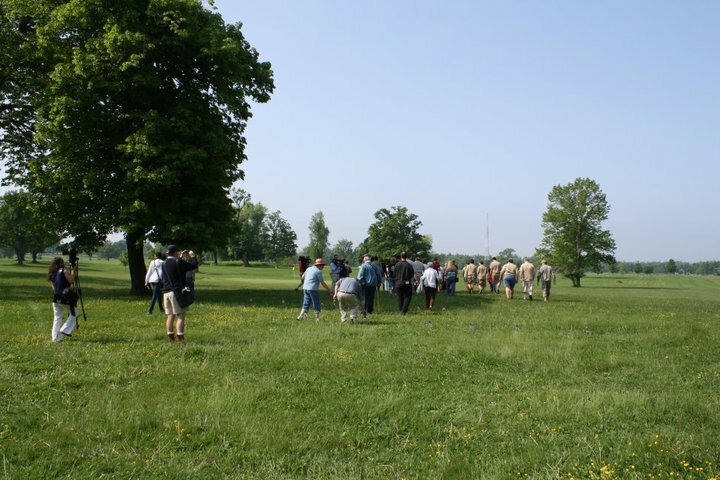 Of the 1700 Pennsylvania volunteers camped at Flint Hill, 600 deserted in a 24 hour period. General Peter Porter wrote an article in the Buffalo Gazette calling Smythe a coward for refusing to move forward with the planned invasion. The two fought a duel with pistols, but both shots were errant, neither hitting the other. Enlist your imagination once again. Picture living in Buffalo, in November and December, in open-ended tents, wearing linen uniforms, and having only very few, if any, blankets, coats, socks and boots. 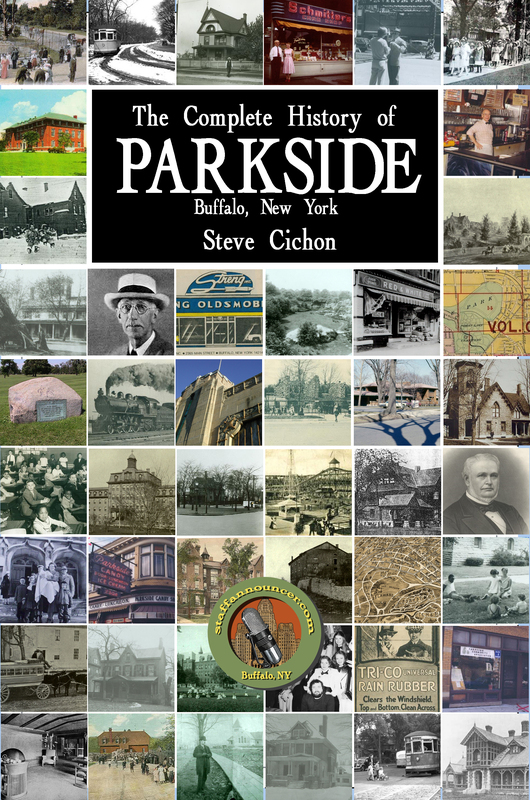 It was these conditions in Parkside in 1813 that yielded the mass, virtually unmarked grave that thousands of Western New Yorkers unknowingly drive by each day as they commute by Delaware Park on Route 198. Up until the time of Smythe’s abortive campaign to invade, the mostly Southern soldiers all lived in mere pup tents. In Buffalo. In the winter. Once the offensive proved a failure, they were ordered to build huts for the winter, but most were slow to comply. The troops stationed on Flint Hill were mostly from Pennsylvania, and even further south, and showed up to Buffalo, in autumn, in their linen uniforms. Now winter had arrived, but more appropriate uniforms had not. Many Buffalo, Flint Hill, and Buffalo Plains families took in soldiers, but the village was just too small to accommodate the great number of troops wintering here. Food supplies were unreliable to the front in Buffalo, and food that arrived was often rancid. Colonel Widner, Smythe’s second in command, stationed at Fort Niagara, had been experiencing the same conditions to the north. He reported in a letter to his commander in at Flint Hill, “We’re starving at this end of the line for bread.” The conditions were same at the camp that ran through what is now Forest Lawn Cemetery, along Main Street to the north, and into Delaware Park. That the enemy have about 3,000 troops one mile and a half in rear of Black Rock, under camp at a place called Judge Granger’s, where the General (Smythe), his aide-de-camp and several officers of rank live.. their camp is unhealthy… they die from eight to nine daily… the dead.. are put into holes two or three of which are made every day, and into each put two to four dead men. The doctors say the disease is as bad as the plague. The patients are first taken with a pain in the head, and in an hour-and-a-half or two hours they invariably die. Besides this disease he mentions their being afflicted with pleurisy, dysentery, and measles. 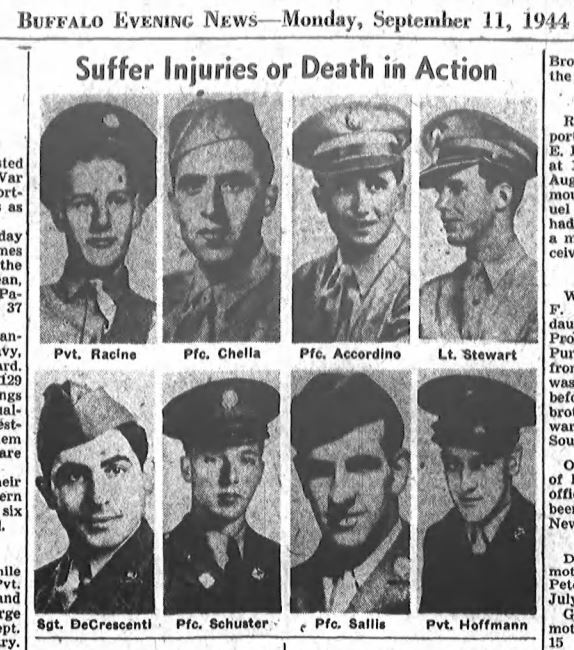 The Buffalo newspapers of the day daily listed the names of the dead, until the numbers became too great; eventually the Army stopped releasing the names. 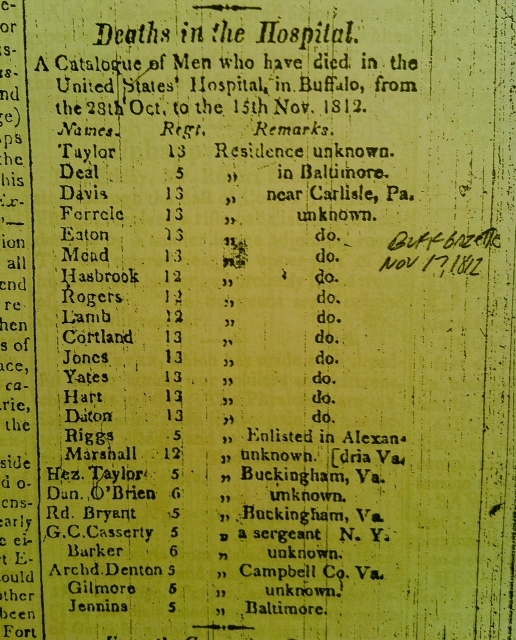 The home towns, listed next to the names, show, once again, that these men, from places like Baltimore, southern Pennsylvania, and Virginia, would have likely had a difficult time acclimating to Buffalo’s winter climate, even without the starvation and disease that was present. From the Buffalo Gazette, on December 22, 1812: The FEVER, which has made such dreadful havoc among our soldiers and citizens, continues to rage. The Physicians are taking unwearied pains to ascertain the character of the disease and to prescribe an effective remedy for it. Bloodletting is generally fatal in violent cases. It wasn’t just soldiers who contracted this illness. While the causes of many of their deaths are lost to history, it’s a fact that many residents of the Buffalo Plains and Flint Hill died during this time. Among those who passed that winter were Samuel Atkins, the first Plains Ranger, and Parthenia Chapin, the wife of Dr. Daniel Chapin. Whether Mrs. Chapin died from one of the many illnesses sweeping through the camp or not, it is certain that she knew of the suffering first hand. It was on the outskirts of the Chapin property that the several daily shallow graves mentioned above were dug. As any gardener in Parkside knows, Flint Hill derives its name from the rocky soil abundant in the area. This is also apparent to anyone who drives the Kensington Expressway; and sees the solid rock that was blasted through near the Scajaquada Expressway interchange. 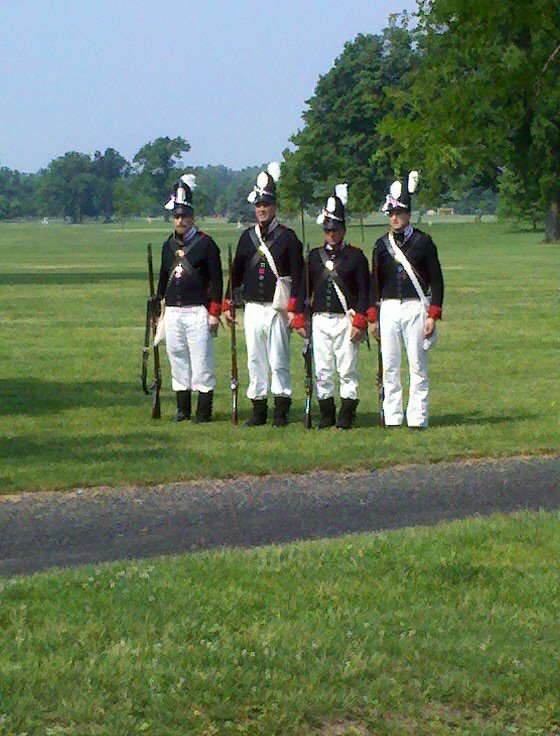 The troops of General Smythe remained at Flint Hill until the following spring. During this time there prevailed among them a typhoid epidemic. Deprived as they were of comfortable hospitals, and a sufficient supply of medical agents, it carried off about three hundred of them. They were put into plain pine board coffins, furnished by William Hodge Sr., and temporarily buried near the south line of the Chapin place; but the rock came so near to the surface that their graves could not be more than about a foot in depth. The ensuing spring they were removed some distance, to the north side of the farm, where the ground was a sandy loam and easily dug. Leave to bury them there being given by the respective owners of the farms, Capt. Rowland Cotton and Doctor Daniel Chapin, they were deposited directly on the dividing line between these farms, in one common grave. Doctor Chapin planted two yellow willows, one at each end of the grave, which have become large trees, and are yet growing. The grave itself remaining undisturbed to this day. The grave was to be known in coming years as “The Mound in the Meadow,” with those willows coming from clippings of a yellow willow taken from Daniel Chapin’s yard. The willows lasted on the site until at least 1896, when on July 4th; a boulder was placed on the site of the grave, with a marker attached. It’s worthy to note that among those dead might not only be US soldiers, but perhaps servants who died while attending to the sick, and perhaps even prisoners of war- Canadian and British being held captive who met the same horrible fate as the Americans. 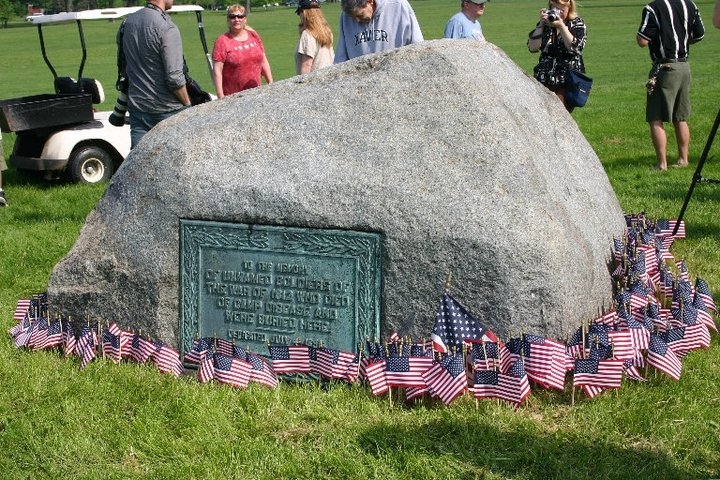 Aside from the boulder in the middle of the golf course, the mass grave of 300 American Soldiers, fallen in wartime service, goes unmarked, and unremembered, having been largely ignored for the last 100 years. Plans to properly mark the spot and honor the dead have come and gone over the last two centuries; you’ll read of those plans as the story continues. As the spring of 1813 broke, and Chapin and Cotton were giving proper burial to the dead, some of those soldiers who had survived the horrible winter began to think pacifist thoughts, and wanted to leave while the getting was good. The commanding officers made an example of several soldiers who tried to desert. As a previously included account spells out, these deserters were knelt in a row and shot in front of several oak trees along Main Street near, generally near what is today Florence Avenue. Their bodies were then hanged from the trees to dissuade any further desertion from the ranks at Flint Hill. The camp extended on Main Street from the present Humboldt Parkway northerly to the lands of Dr. Daniel Chapin… and westerly to the head of the Park Lake, on lands belonging to Erastus Granger. On the Main-street front of this old camp-ground stand several venerable oaks, relics of the old camp. The one directly opposite the Deaf and Dumb Asylum is distinguished as the one under which a row of soliders kneeled when shot for desertion in the spring of 1813. They finally entered the conflict when their friend, Erastus Granger, was in peril. The Canadian British put a price on his head, and had Flint Hill… yes, modern day Parkside… marked for destruction. Judge Granger received word of this on July 10, 1813, and sent word to the greatest Seneca warrior of his time, the old chief Farmer’s Brother. Granger’s longtime compatriot, who fought in both the French and Indian War of the 1760s, and the American War of Independence, had received a medal from George Washington for his service. It was also “from Washington’s lips” that came the name “Farmer’s Brother,” by which the chief would be known for the rest of his days. A man of at least 80 years old in 1813, Farmer’s Brother traveled from his hut in the Indian village in today’s South Buffalo, to what’s now the Parkside neighborhood, with warriors in tow, ready to fight. The Indians readied for war at the Granger home on Main Street. James Granger wrote an account of the night in his 1893 book Granger Genealogy. The chief and his followers arrived at 11 o’clock, and the night was spent preparing for the coming fray. Bullets were molded by the great fire in the kitchen (of the Granger Homestead), messengers hurried into the neighboring village for arms and ammunition, and the Indians were banqueted on unlimited salt pork prepared by Mrs. Granger’s own hands. The Senecas prepared for battle in a ritual never seen by the American troops assembled at the spot. They took of all of their clothes– stripped down to their breechcloths. Granger and the Senecas were on the right side of the line, regulars in the middle, white volunteers to the left, ready to take on the British. At the order of General Porter, the Indians leapt forward with a yell that startled both their enemy… and their allies. Within minutes, the enemy had retreated. The Indians had even rushed into the water to pull soldiers from their boats as they paddled in retreat for the safety of the Canadian shore. The victory was complete. Buffalo, Black Rock, and Granger’s Flint Hill Estate were safe, for now, due mostly to the tenacity of Farmer’s Brother’s men. As the British and their Indian allies made their way towards Buffalo, the women and children of the village moved north up Main Street in an obviously harried fashion. Though many fled as far as Clarence Hollow and Williamsville, many dozens sought refuge and stayed safe in the home of Judge Granger on Flint Hill, and in the homes of the Buffalo Plains. In fact, none of the buildings as far north as current day Parkside were burned as the British and their Indian allies left Buffalo a pile of smoldering timber. It made the area, especially Granger’s place, a location where many women and children took up semi-permanent residence, while the men who weren’t taking to arms took to rebuilding the village. 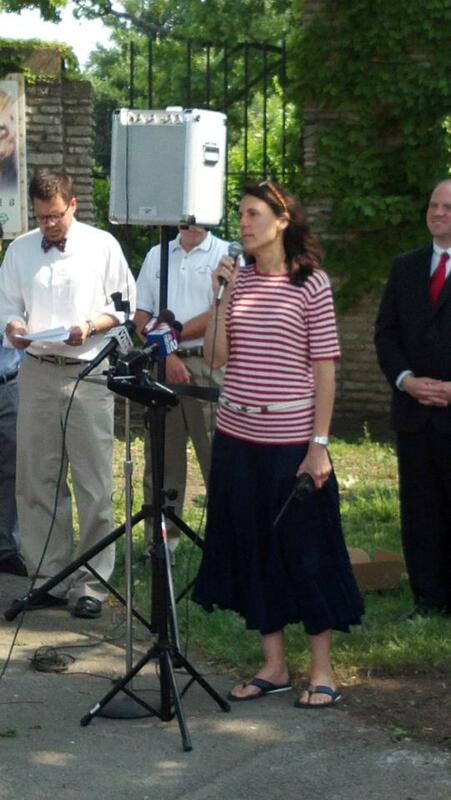 Granger’s Creek is today Scajaquada Creek. The bridge talked about, though well hidden, still goes over Main Street near Jefferson. 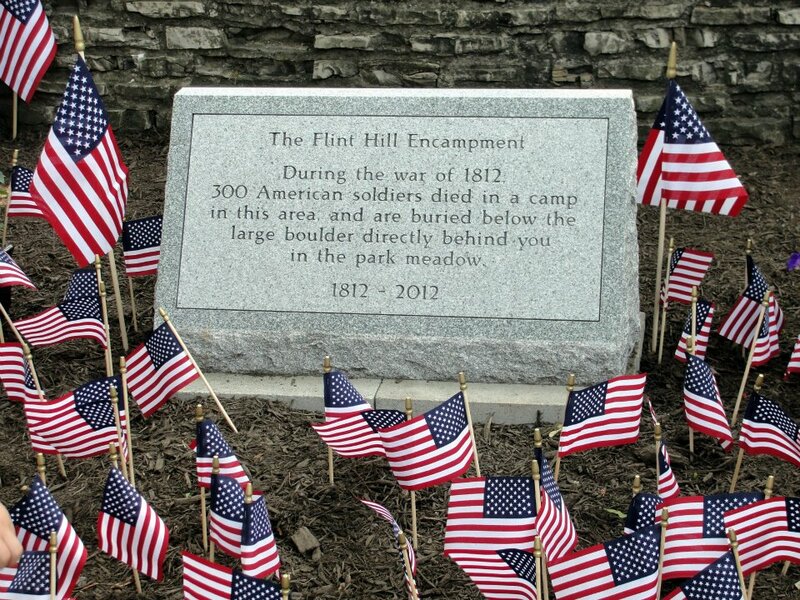 But the soldiers who lived through the rest of the winter of 1813 on Flint Hill had not yet seen the worst of it all. A horrific lasting monument to the war, still in Parkside, but little known, had yet to be created. The FEVER, which has made such dreadful havoc among our soldiers and citizens, continues to rage. The Physicians are taking unwearied pains to ascertain the character of the disease and to prescribe an effective remedy for it. Bloodletting is generally fatal in violent cases. The grave was to be known in coming years as “The Mound in the Meadow,” with those willows coming from clippings of a yellow willow taken from Daniel Chapin’s yard. 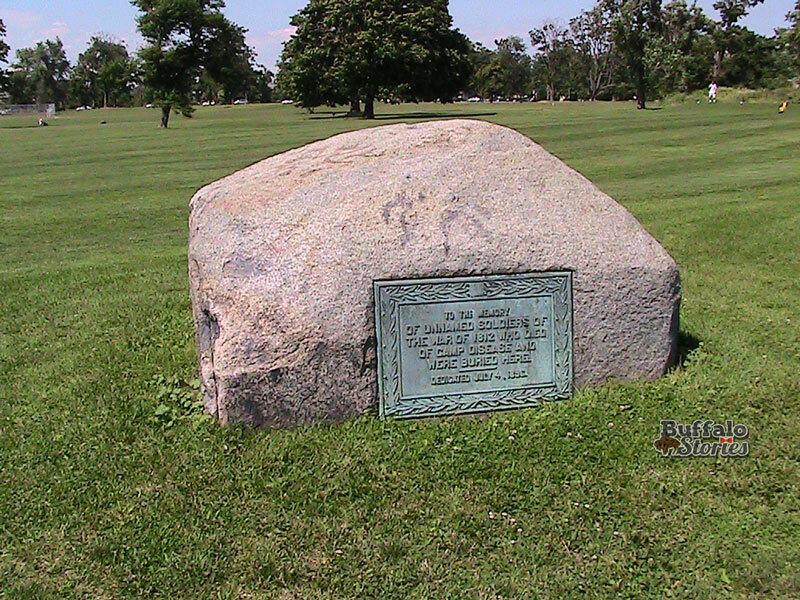 The willows lasted on the site until at least 1896, when on July 4th; a boulder was placed on the site of the grave, with a marker attached. It’s worthy to note that among those dead might not only be US soldiers, but perhaps servants who died while attending to the sick, and perhaps even prisoners of war- Canadian and British being held captive who met the same horrible fate as the Americans. 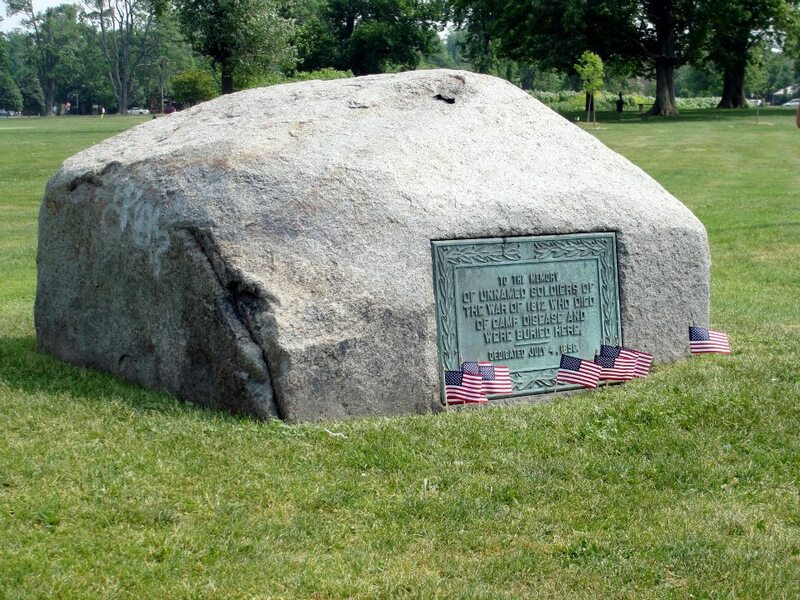 The boulder and the remains of roughly 300 souls are still buried below the park meadow, in the middle of what is now the Delaware Park Golf Course inside Ring Road. 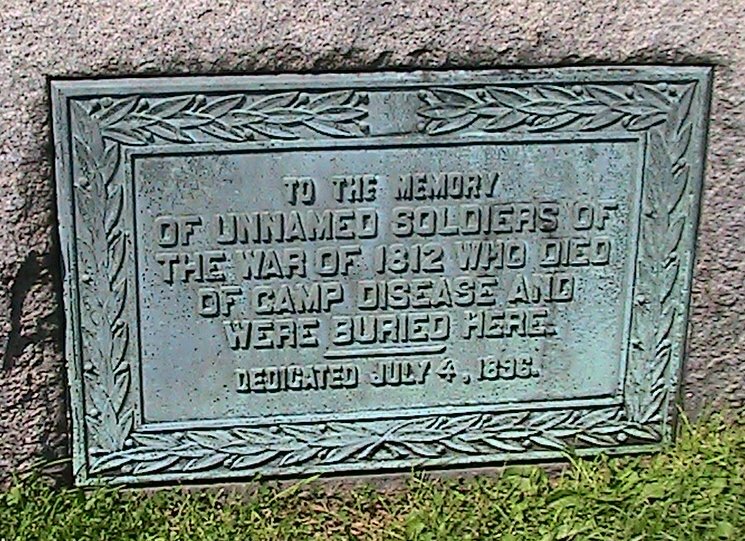 The marker reads: To the memory of the unnamed soldiers of the War of 1812 who died of camp disease and were buried here. As the War of 1812 raged on into 1813, and then 1814, a much more well-organized effort to invade British Canada was hatched. 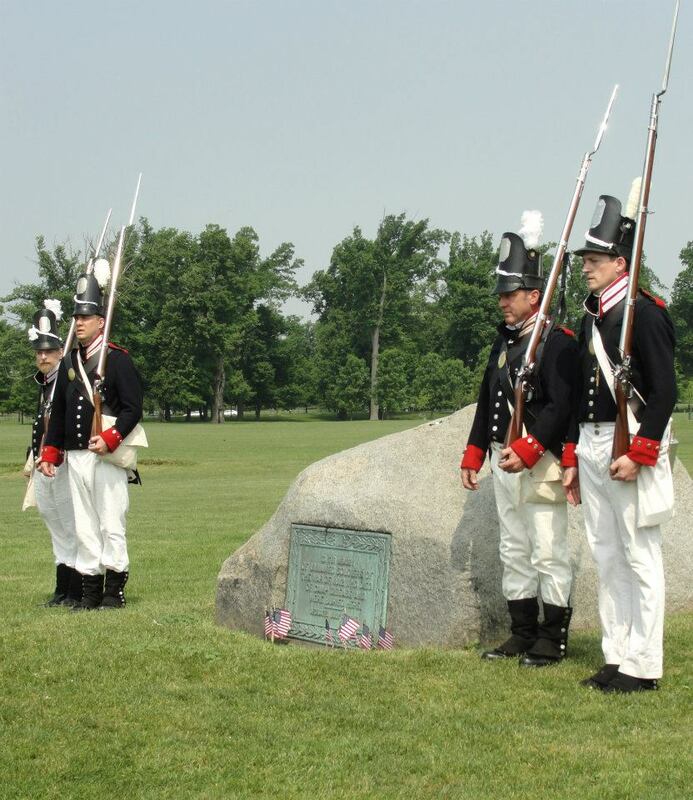 A year after the bungled attempts just outlined, some of the soldiers poised to invade Fort Erie made their pre-attack camp once again in what is now Forest Lawn Cemetery, Delaware Park, and the Parkside neighborhood. In the spring of 1814, the more successful plan to invade Upper Canada was devised by a man, unlike General Smythe, who was a master tactician. Brigadier General Winfield Scott would lead his men to victory just over the Niagara River in the Battle of Chippawa; many joining the battle from their home base on Flint Hill. Scott, known to his men as Ol’ Fuss and Feathers, on account of his insistence upon military appearance and discipline, later wrote books on infantry tactics, exercises, and maneuvers that are still used by the US Army to this day. Many of these formation schemes and tactics were first devised as Scott prepared for battles such as the one at Chippawa. 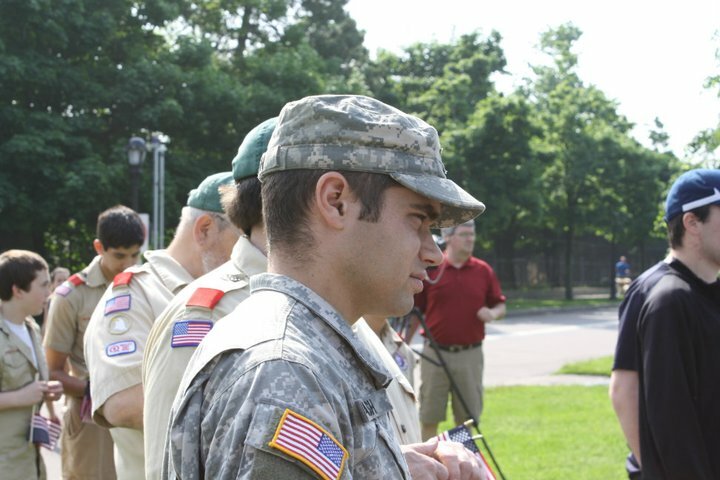 It’s therefore natural to assume the drills and discipline that would emerge as the foundation for the teaching done at West Point were first practiced by “the man who wrote the book,” in staging grounds and base camps like the Delaware Park Meadow.